Brig – Good Night Inn – (£293 for 4 nights) – only a 5 minute walk from Brig Railway Station the hotel seems to cater for large tour groups but their large, clean rooms are more than adequate for the budding independent tourist. Buffet breakfast is included in the room rate and the hotel made us up a pack-up the morning we left before breakfast. The staff were friendly and helpful. 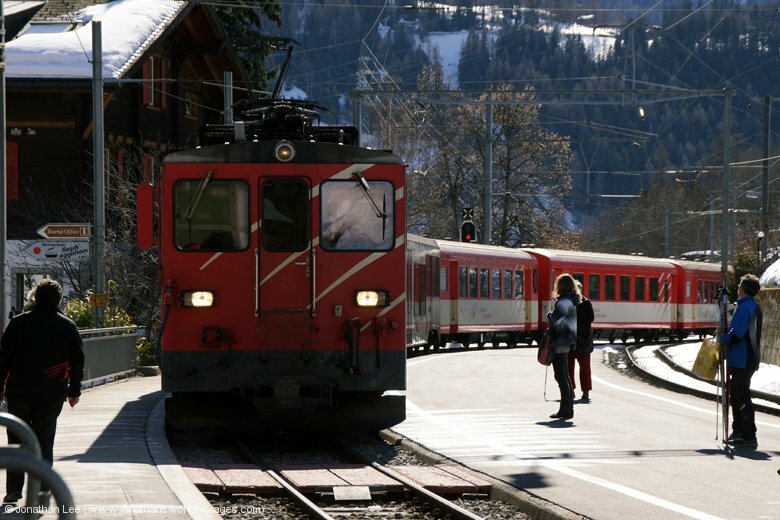 Chur – Hotel Chur – (£226 for 2 nights) – a 5 minute walk from Chur Railway Station; this independently run place has a cosy feel. Our room was one overlooking the front of the building, with great views of the snow-capped mountains in the mornings. We were actually given a family room as opposed to a double room; which had way more space than we needed with the double part of the room being adequate without the attached kids room. The staff were friendly and the buffet breakfast was included in the room rate. Locarno – Ramada Hotel La Palma ua Lac – (£196 for 2 nights) – a 5 minute walk from Locarno Railway Station; this 4 star Ramada Hotel offers absolutely cracking views of the Lake and surrounding mountains. The room was spotless, as you’d expect from a 4 star hotel, and the place gave the overall impression that you were being treated to a bit of luxury; just from the lobby alone. Breakfast was included and the variety was the best we’d had in Switzerland and included some hot food as well. Having travelled down to London the night before we departed the Heathrow Ibis at 0600 for our 0750 BA flight to Basel; from Terminal 5. London Transport buses are free within the Heathrow area; this making the Ibis, and other hotels within the free zone, very good choices to stay at. All the bus details are on the Ibis website. The usual Heathrow endurance task wasn’t too bad but my girlfriend did have to empty her bag as her tablet was still inside; yet the guy at security had told me I didn’t need to take mine out and I didn’t have to empty mine! 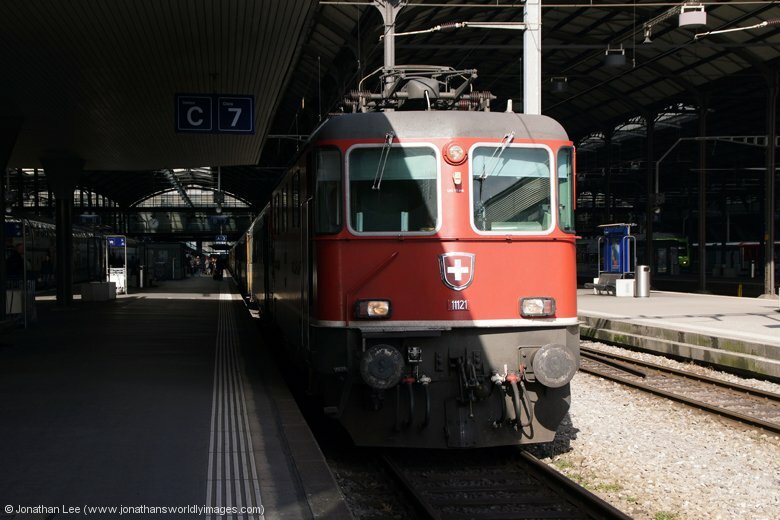 Arrival into Basel was prompt and we were soon heading out of the Swiss exit and towards the front doors; outside which was the No. 50 bus, every 10 minutes, to Basel SBB station. 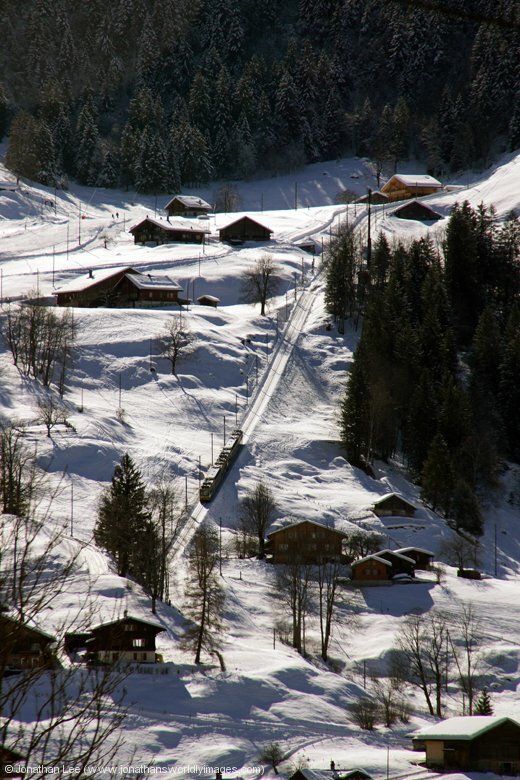 If you already have a Swiss pass this bus route is included and therefore free. Otherwise tickets are purchased from the machines by the stop before boarding. We ended up with plenty of time to spare at Basel SBB station and spent the majority of it admiring the chocolate shops on the station’s footbridge. 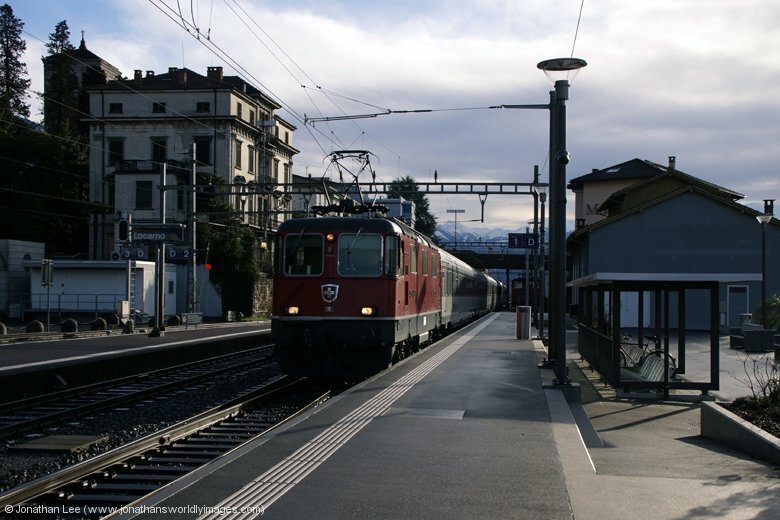 The set to form our IR2173 1204 Basel – Locarno arrived promptly, just 9 minutes before it was due out again, with Re420 11156 working IR 2170 0711 Chiasso – Luzern. Before I got to the other end to check what the loco was Re420 11118 had already dropped on and was being coupled by the shunter. I was more than surprised to see a familiar face walking towards me while pointing my camera lens at 11118; it was only Steve Kibble! Not a person I’d have ever expected to branch out into Euro bashing, but here he was and kept us company to Olten; which was where we’d end up later that afternoon having done a circle via Luzern and Bern! 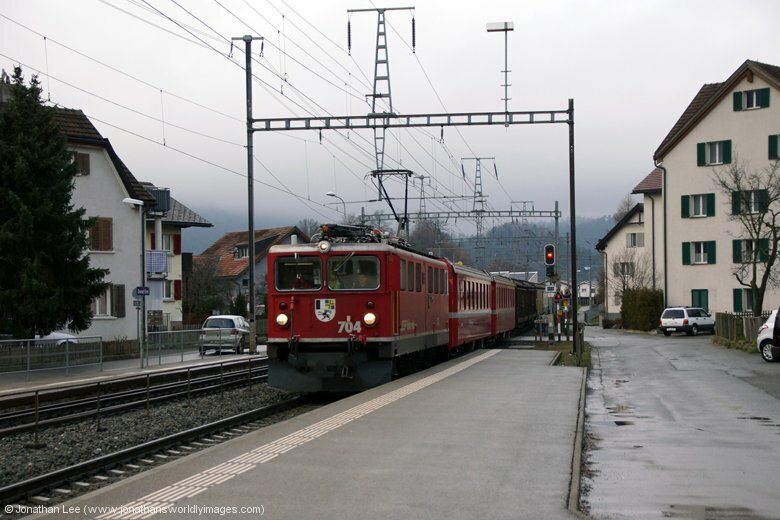 Kibble had informed me that SBB Cargo Re421 421391 was out on the Voralpen Express trains and that BLS Re420 420502 was out on the Luzern – Bern circuit vice Re465. 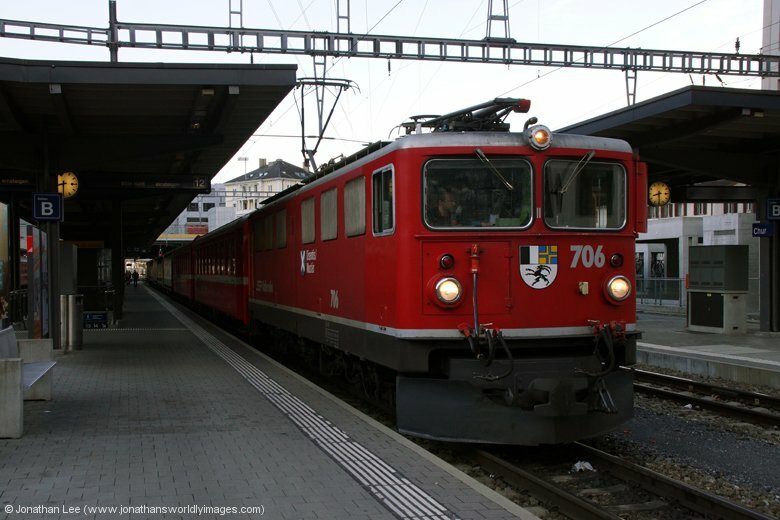 My hopes when planning the trip had been that I would manage to get an Re420 in from Luzern to Bern and I worked out that 420502 should do the 1457 ex Luzern, which was one of the two trains we could cover; imagine the surprise when we passed 420502 propelling the 1257 Luzern – Bern away from it’s origin as we approached Luzern! Not my best attempt at working out a loco’s diagram; it was on the correct turn, I’d just worked it out wrongly. 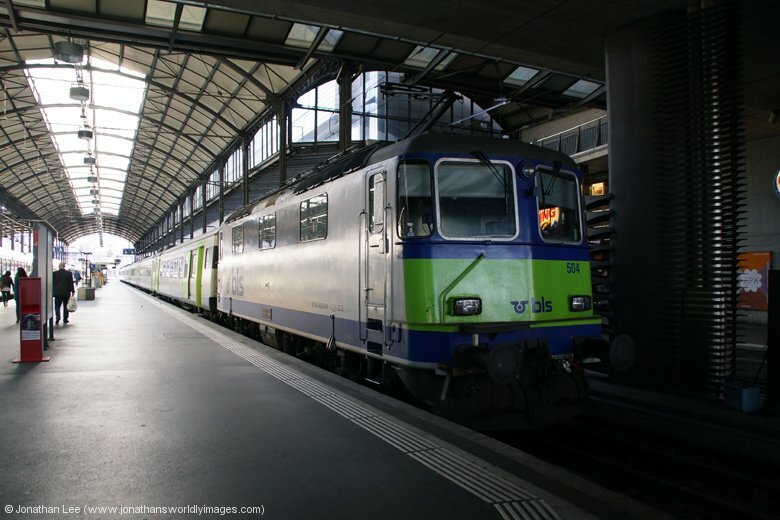 My hopes of getting a BLS Re420 to Bern dashed I reverted to my original plan anyway which was to do the 1340 Voralen Express out to Meggen Zentrum for the next one back in; this move soon went in the bin when it was formed of SOB RBDe 561 EMU’s. 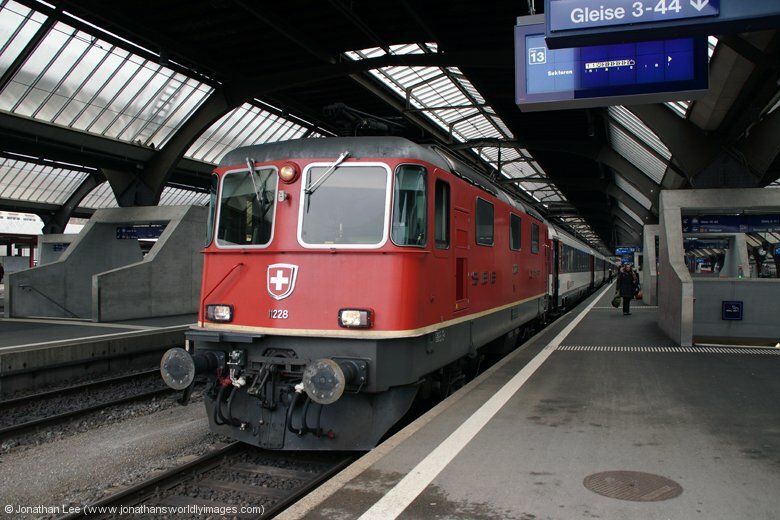 Not to worry though as there was a back-up to that as Kibble had informed me that SBB Re420 11135 was out on Zürich – Luzern shuttles vice Re460 and it should be the 1335 Luzern – Zürich; by diagram. 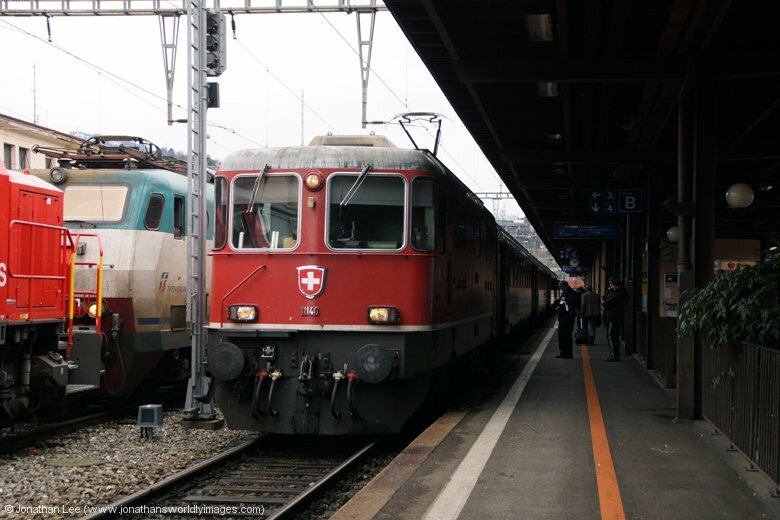 My time in Luzern wasn’t turning out to be very well spent when Re460 460013 rolled in with it’s booked double deck set to form the 1335 to Zürich; at that point I decided enough was enough and that the 1357 Luzern – Bern looked like the answer, this meaning we’d be able to get to Olten for the Re420 that worked Bern – Olten on a Sunday. 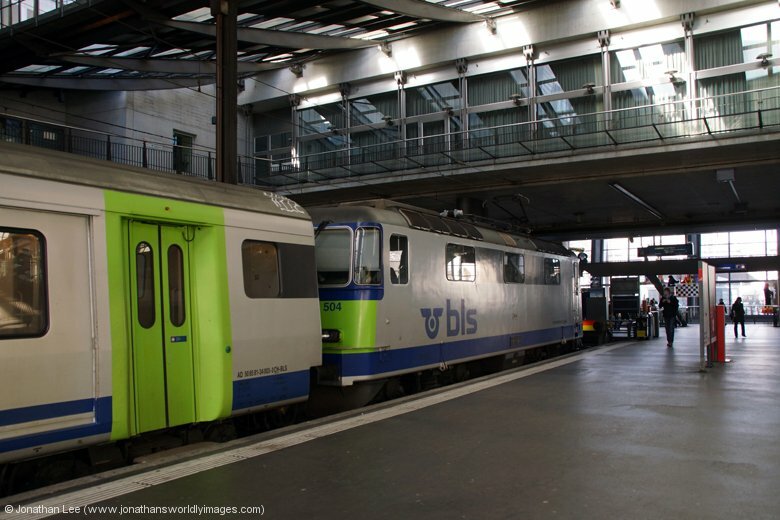 So having nipped outside for a quick scan before boarding the 1357 I couldn’t quite believe it when I found BLS Re420 420504 on the blocks ready to propel the 1357 Luzern – Bern to its destination; maybe my day wasn’t going to be a washout after all? It was a nice journey to Bern, on an empty train. We didn’t have much time there though and were Olten bound within 10 minutes of arriving. 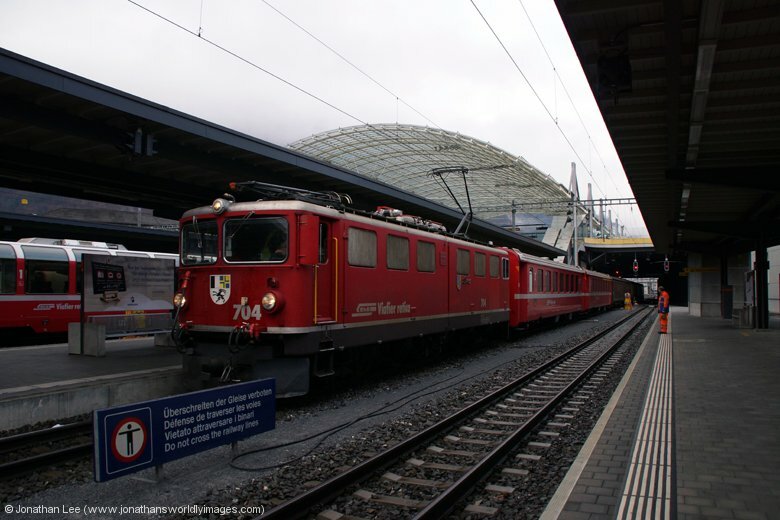 Upon arrival at Olten we found SBB Re420 11155 waiting to depart with RE3230 1606 Olten – Bern; it was in the platform adjacent to where we’d stopped on 11118 some 3h30m previous. From Olten we were Brig bound; unfortunately the three step-backs en-route at Bern, Thun and Visp offered up only one new engine for me. We arrived into Brig an hour earlier than I’d planned though and were soon at the Goodnight Inn; where we’d stayed on a previous trip. Unfortunately this time our room didn’t offer a fantastic view of the surrounding mountains but it was clean and spacious and perfect for what we needed. The Channa restaurant in Brig had been recommended to us by the Goodnight Inn staff last time we were there; the food being excellent and the staff friendly and English speaking. We used the Channa every night we were in Brig and the food didn’t disappoint at all. A check out of the curtains, at 0600, revealed a layer of snow on the ground; which was always a good sign if the sole purpose of your holiday was to see snow covered landscapes! We’d made arrangements with the hotel staff for a “goodie bag” to be made up that morning; as we were out of the hotel well before breakfast. Just when I was beginning to think we might have to leave without it the first member of staff arrived and having been told what we were waiting for, checked her handover notes and sure enough retrieved two bags from the back room; both of which contained a sandwich, juice, water and a large bar of chocolate. 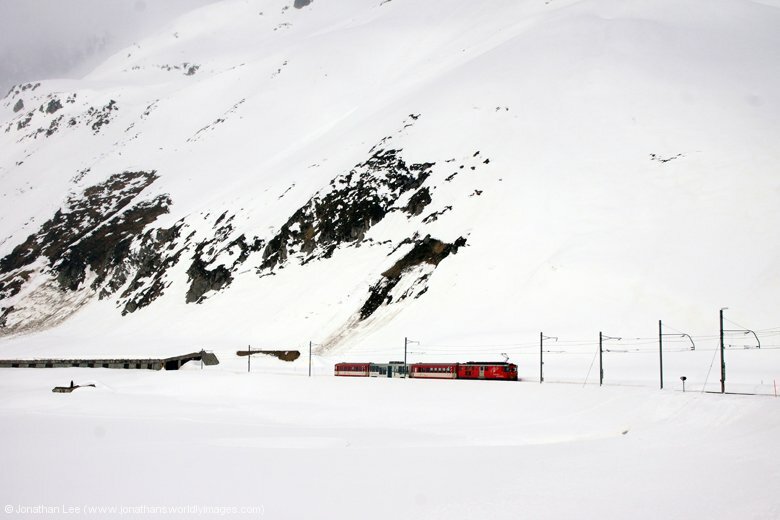 Our plan for the day was to visit Jungfraujoch and the weather could not have been better for such a visit. By the time we got to Visp the sun had started to come up but there was some low cloud hovering over the lake. The journey round the lake to Interlaken was excellent though; the rising sun lighting up the mountain peaks as it clambered over those on the opposite side, glinting off the snow as it did so. 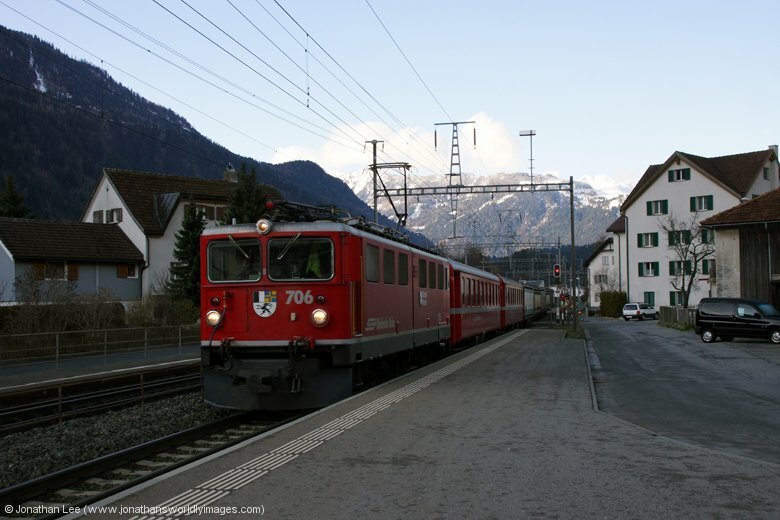 When we arrived into Interlaken our Berner Oberland Bahnen (BOB – part of Jungfraubahn – JB) train was sat in waiting to go with the conductor ushering people to the right portion of the train; Lauterbrünnen at the front and Grindelwald at the rear, the train splitting at Zweilutschinen en-route. 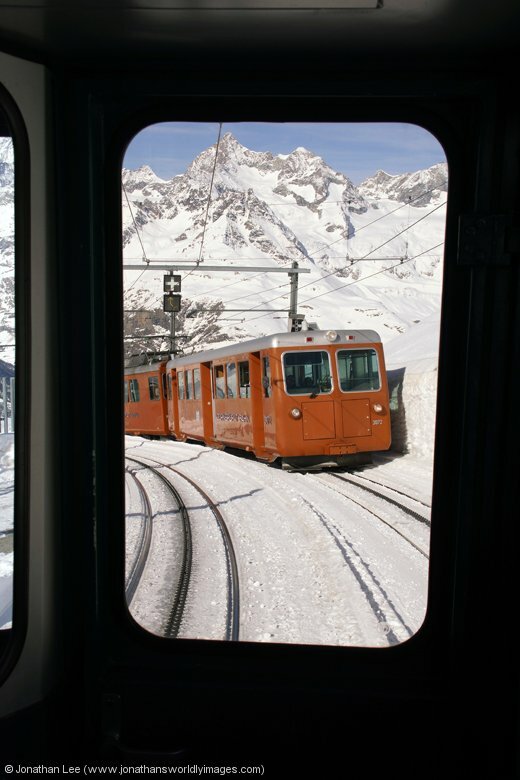 As it was holiday season in Switzerland as well as in the UK, the train was wedged to the gunnels with ski folk; thankfully we managed to get a seat though before everyone had managed to transfer themselves, and their skis, from the Basel – Interlaken train we’d just got off. As regular tourists, without any ski equipment, we were definitely the odd ones out on the train! 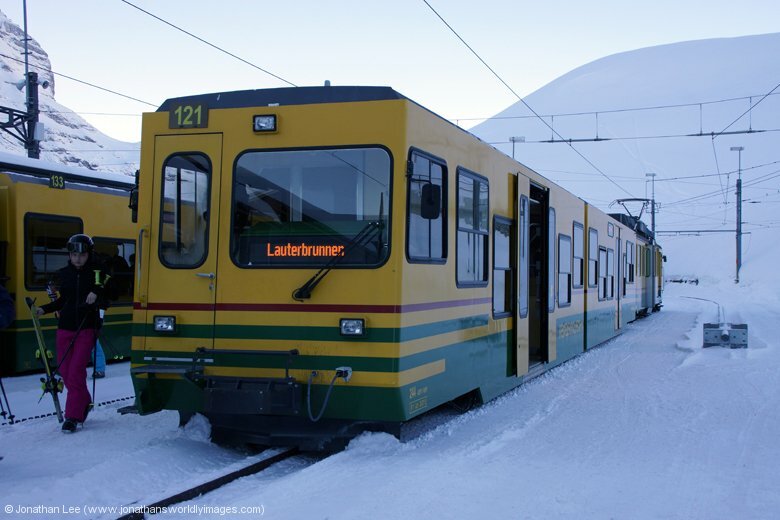 The conductor on board couldn’t sell us tickets from Lauterbrünnen to Jungfraujoch and we had to rush to the ticket office at Lauterbrünnen to get it sorted before the train to Kleine Scheidegg departed some 7 minutes after our arrival. 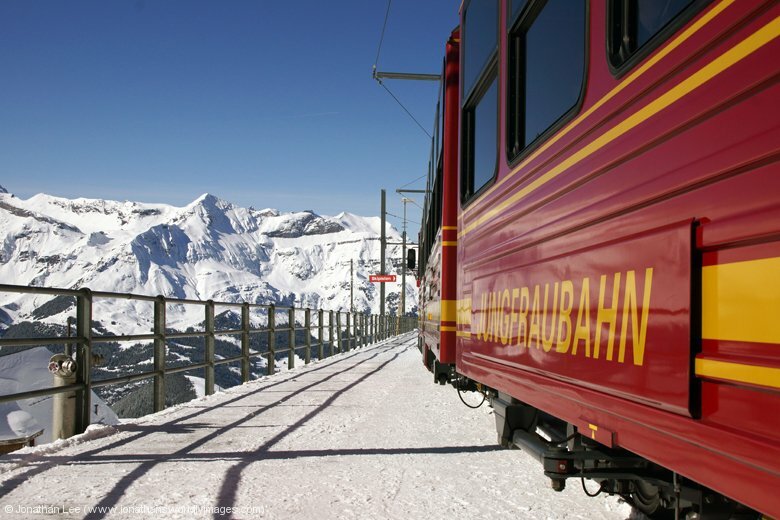 Swiss Passes are valid on the Interlaken – Lauterbrünnen/Grindelwald sections but not beyond. 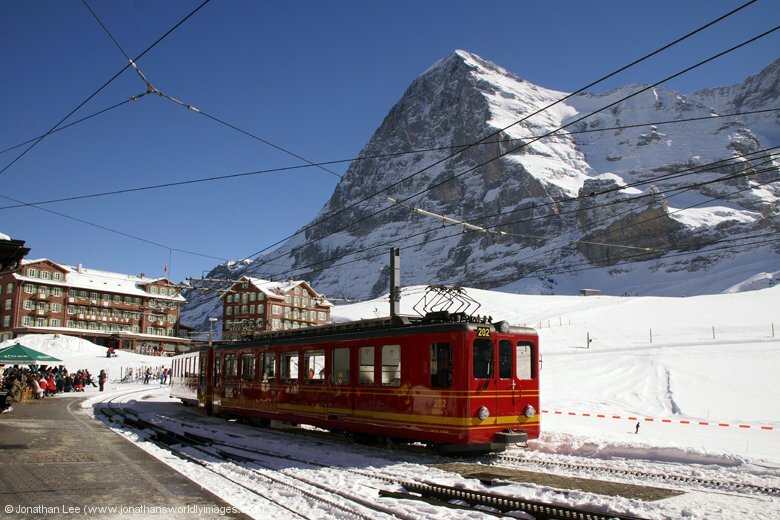 There is a discount with Swiss Passes of 25% which resulted in us paying CHF131 each for a return ticket to Jungfraujoch; this also allowed travel back via Grindelwald vice Lauterbrünnen and would do so whichever route you took. 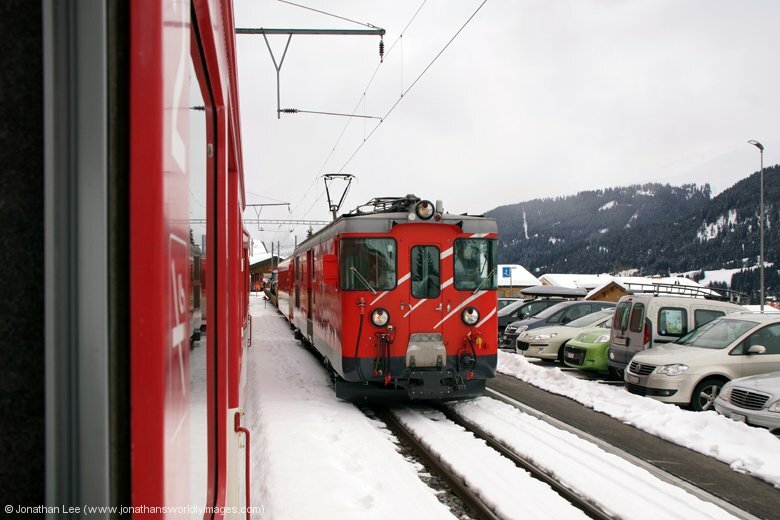 Our Wengeralpbahn (WAB – part of Jungfraubahn – JB) train was waiting over the far side of the station to take us up to Kleine Scheidegg; there were actually three train sets, all of which ran one behind the other, two went to Kleine Scheidegg and one terminated at Wengen. 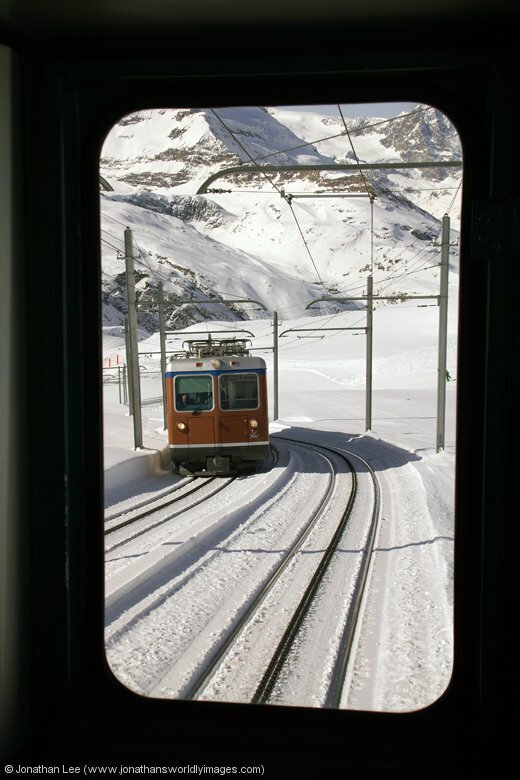 Again all were loaded with ski folk but again we managed to get a seat on the emptier of the two sets heading to Kleine Scheidegg. As we departed Lauterbrünnen the sun was getting higher in the sky and the snow began to get deeper and deeper as we climbed higher and higher up the mountains. 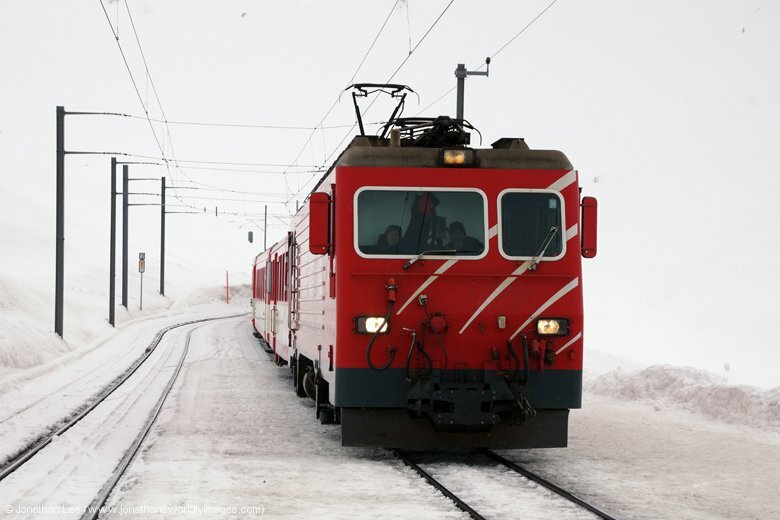 By Kleine Scheidegg it was just like being in a Winter wonderland; and it was freezing cold! The skies were crystal clear, blue and with no cloud to be seen anywhere. 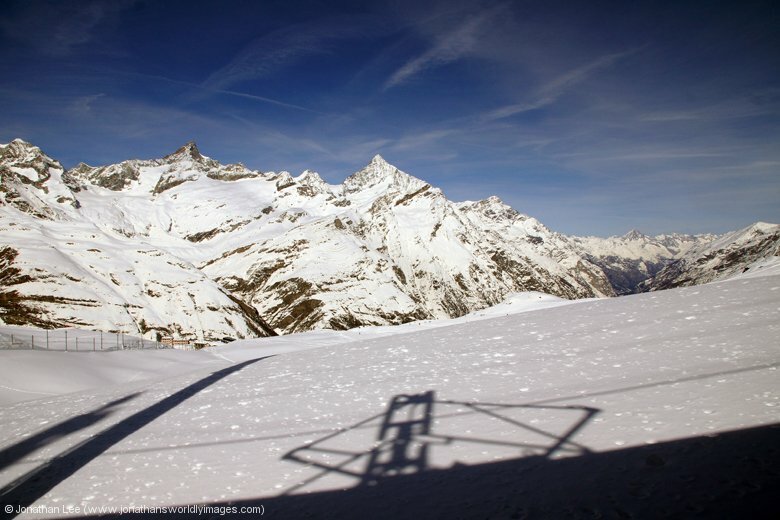 The whole area was surrounded by mountains, all covered with fresh snow; evident by the wind lifting it off the peaks and it glinting in the sun. 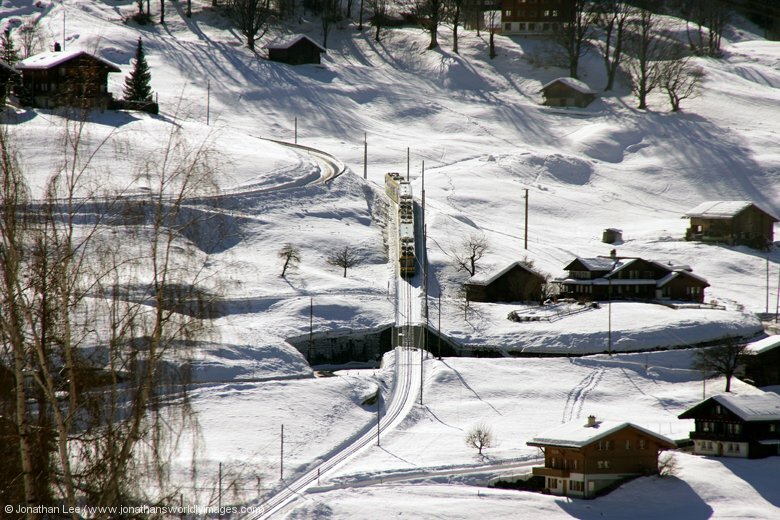 It was a skiers paradise, with the ski run from Kleine Scheidegg starting literally at the platform end. Not only were there timetabled trains running, there were also loads of trains knocking about, all formed of WAB’s 1947 built BDhe4/4 EMU’s with flat wagons for the ski/sledging equipment to be loaded into. 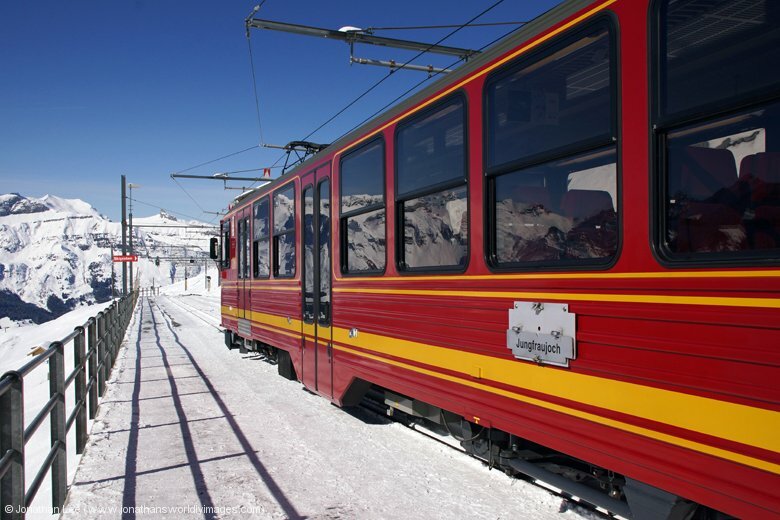 Interchanging at Kleine Scheidegg is easy with the red Jungfraubahn (JB) train to Jungfraujoch always departing from the same platforms. 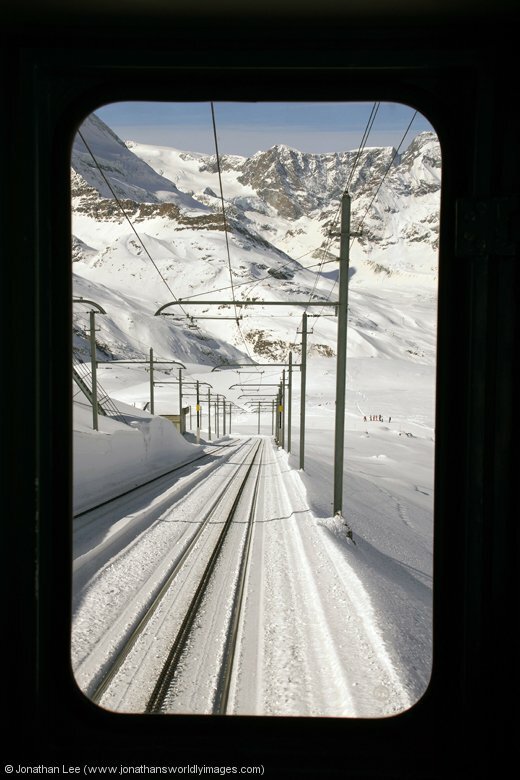 Despite Kleine Schedegg being a skiers heaven many also went to Jungfraujoch as well; thankfully though the train wasn’t wedged like the previous two had been. 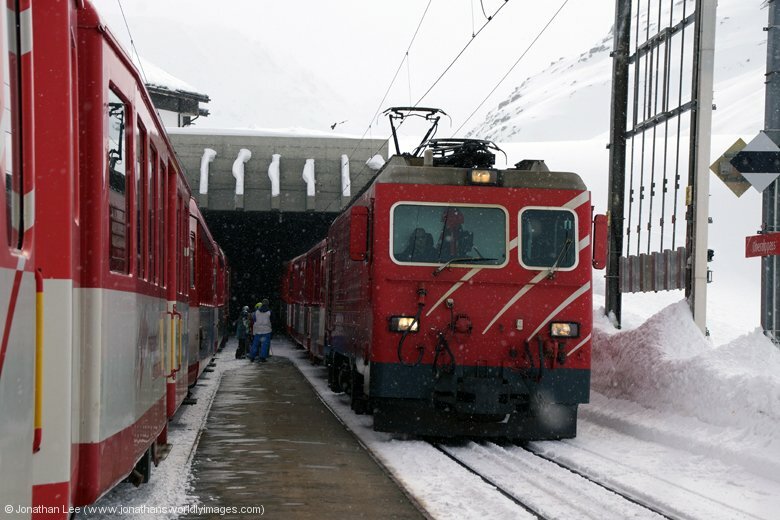 The journey from Kleine Scheidegg to Jungfraujoch is almost all in a tunnel; the short journey to Eigergletscher being the only outside stretch. From Eigergletscher the view back down to Kleine Scheidegg is excellent and you get your first real taste of feeling like you’re at the top of the world as you begin to look down on mountain tops! Once in the tunnel sections the JB train stops at two places en-route, purposefully for everyone on board to get photos from the massive viewing windows built into the mountain sides. The first stop is Eigerwand at 2865m/9400ft; the views from which are across mountain peaks as far as the eye can see or weather permits. The second stop is Eismeer at 3160m/10368ft; the views from which reveal a desolate landscape, surrounded by mountain on every side, a stark difference to the view from Eigerwand. 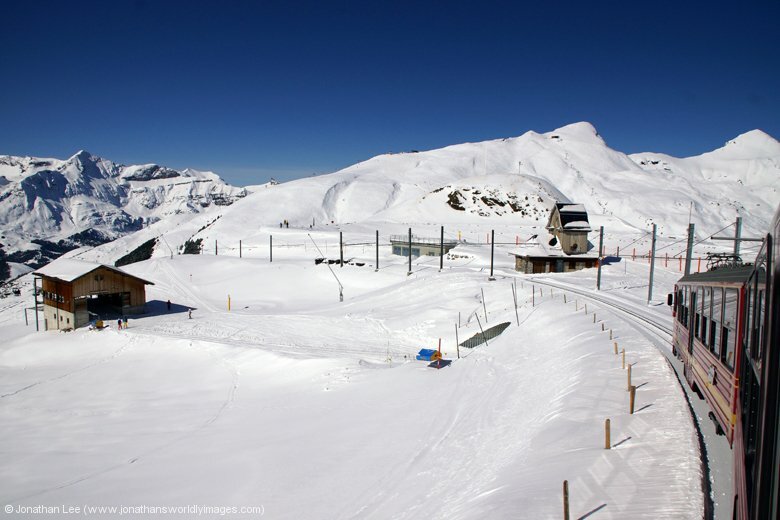 Jungfraujoch station is still inside the mountain itself at 3454m/11333ft; it isn’t until you walk out of the station and enter the world that is situated between the peaks of Monch (4107m) & Jungfrau (4158m) that you really begin to appreciate just where you are; above the clouds, staring out above 3500m peaks at some of the highest mountains in Europe and having reached it by the highest railway in Europe. We couldn’t have picked a better day to appreciate the views with bright sunshine, fresh snowfall, clear skies and a spattering of clouds down below, resting on the tops of 2500m peaks! The views from the Sphinx at 3571m were different to those from the Plateau down below and with views of high peaks, snow covered landscapes and glaciers what more could you want from the trip? There was more on offer within the mountain/ice though, the highlight for us being the ice palace. This being various sculptures that have been carved out of the ice, deep within it, that have to be constantly tended to while the ice moves; the layers within it being clearly visible where it’s been cut through. 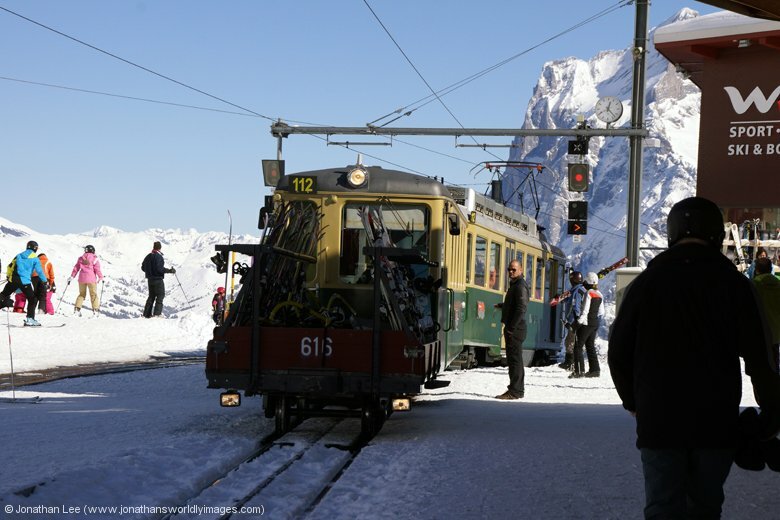 By the time we’d done what we needed to we’d only spent an hour at Jungfraujoch; where the temperature outside was only -18C!! 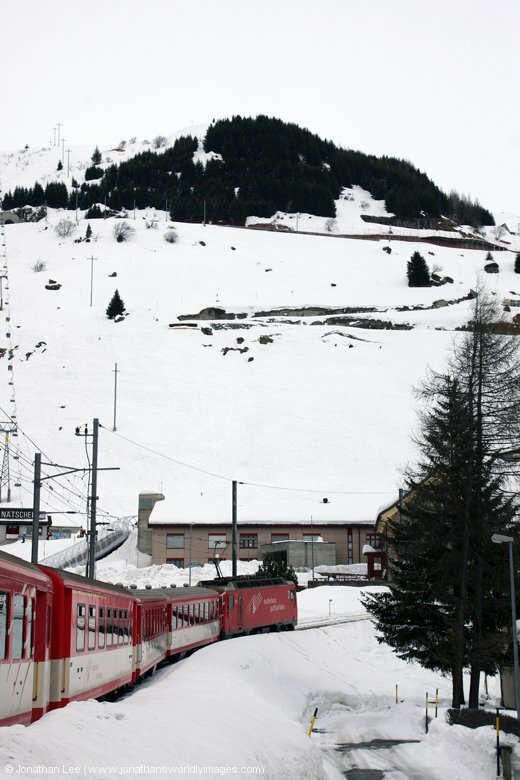 We rode back down to Kleine Scheidegg on a very empty train; which doesn’t stop for photos at Eismeer & Eigerwand on the way down. 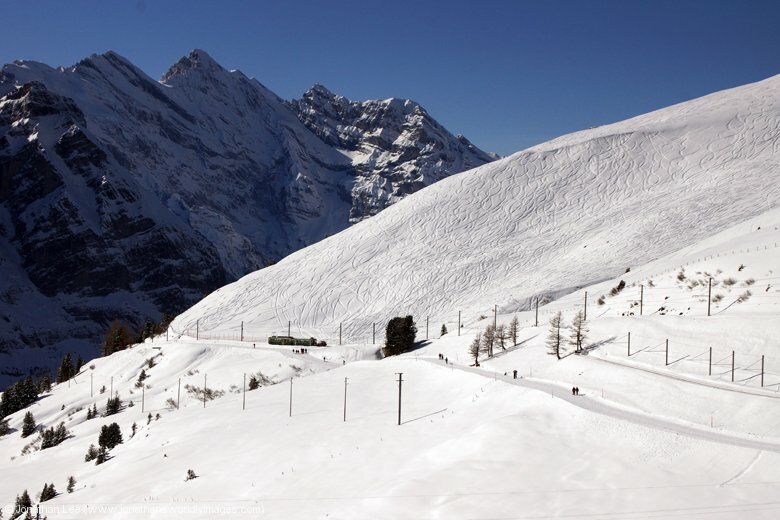 We were ready for lunch at Kleine Scheidegg but decided to give it a miss as the restaurants were full to brimming point with skiers taking an afternoon break; so we decided to head straight down to Grindelwald and see what was on offer there. 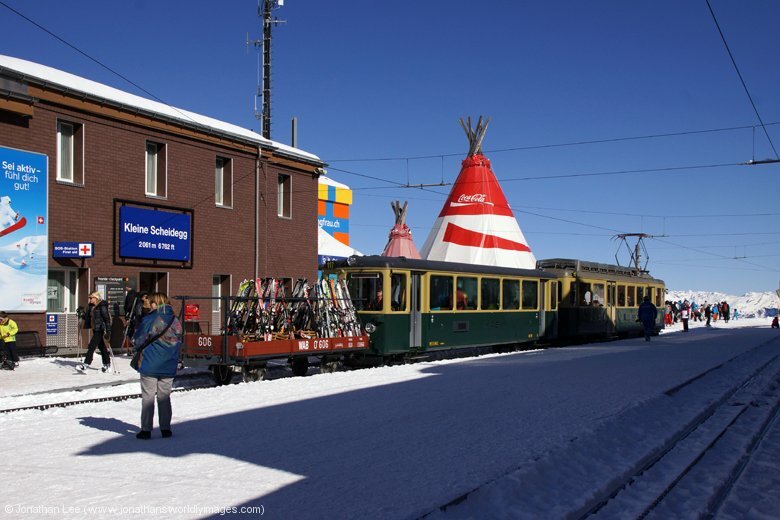 The journey to Grindelwald was very different to that of the one up from Lauterbrünnen, mainly because it was daylight but in my opinion the Grindelwald – Kleine Scheidegg section is better than the section from Lauterbrünnen. 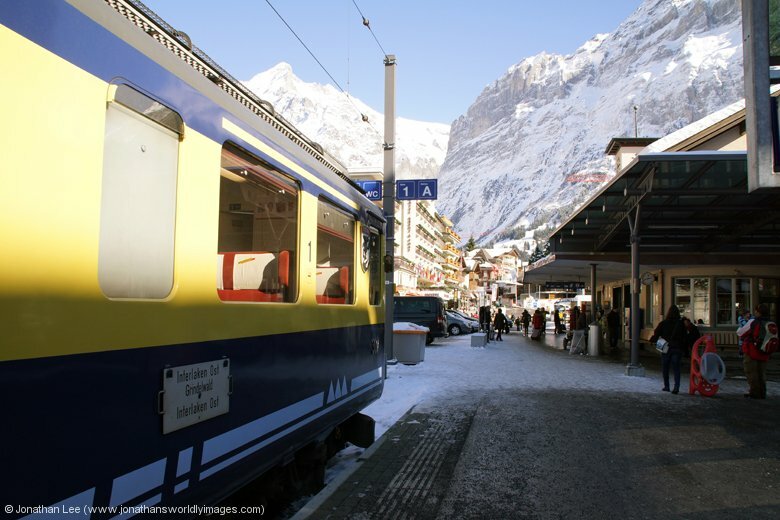 Grindelwald itself being visible from a long way up and once at Grindelwald station you can watch trains climbing/descending the adjacent mountain which gives a real feel for just what the trains are put through on a daily basis with the climbs they make. 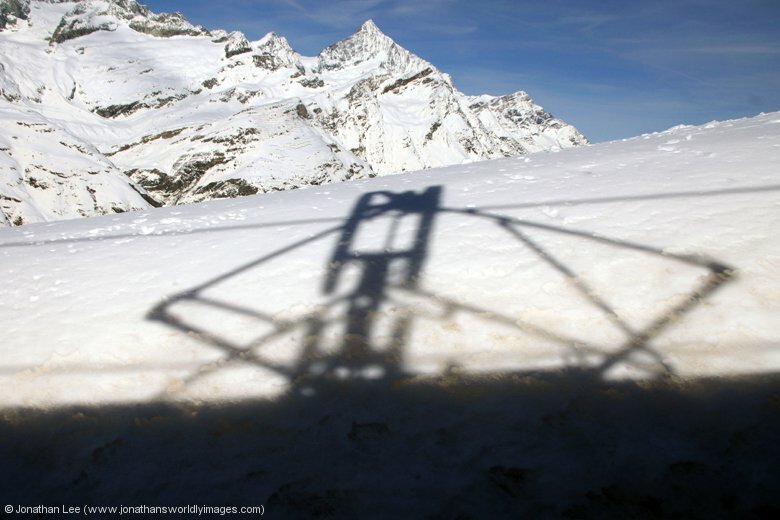 There are plenty of places to eat in Grindelwald but we were glad we walked up the main road, away from all the places by the station, to the Hotel Eiger’s Memory Restaurant; which served up an excellent rosti, still in the pan it was cooked in. 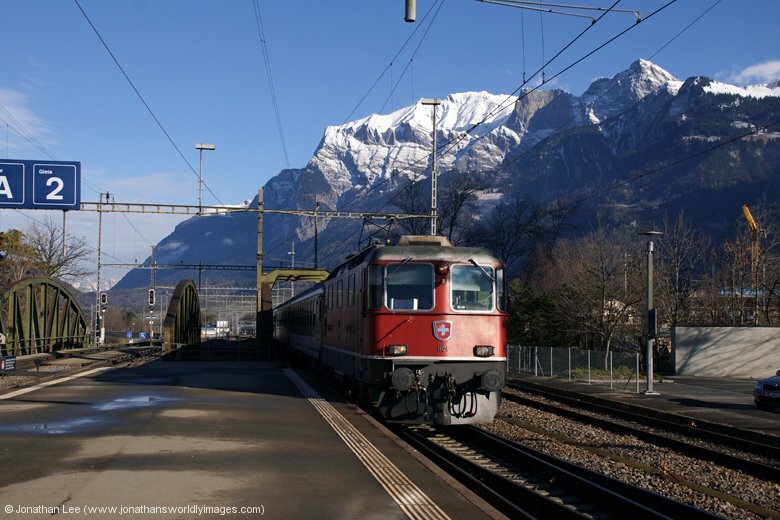 Our journey back down to Interlaken was with BOB’s ABeh4/4 1965 built EMU #307 which was joined with sister #310 at Zweilutschinen with the Lauterbrünnen portion. The scene at Interlaken Ost was unfortunately not a good one; one which only 12 months previous would have been completely different. 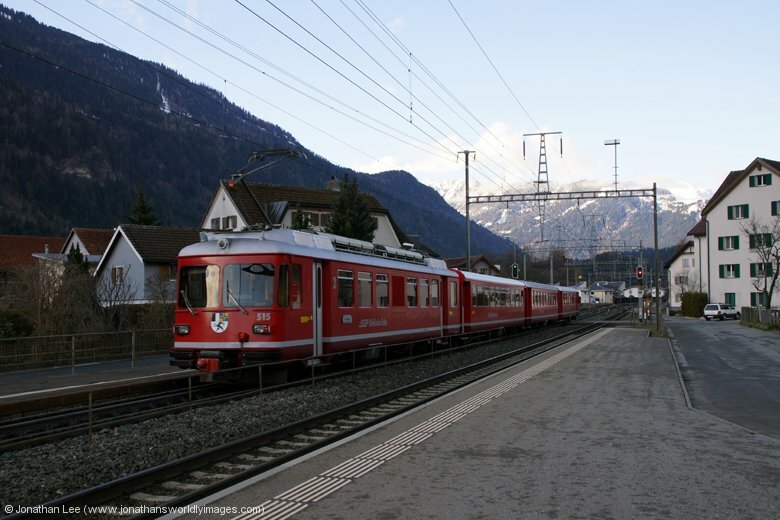 ZB’s 1604 Interlaken Ost – Luzern being a new EMU, which 12 months previous would have been a 1941 built De110 and although the nice shiny BLS EMU on the 1529 to Spiez wouldn’t have been much different the 1708 departure to Zweisimmen would have been a BLS Re425; unfortunately now the train was EMU’s! 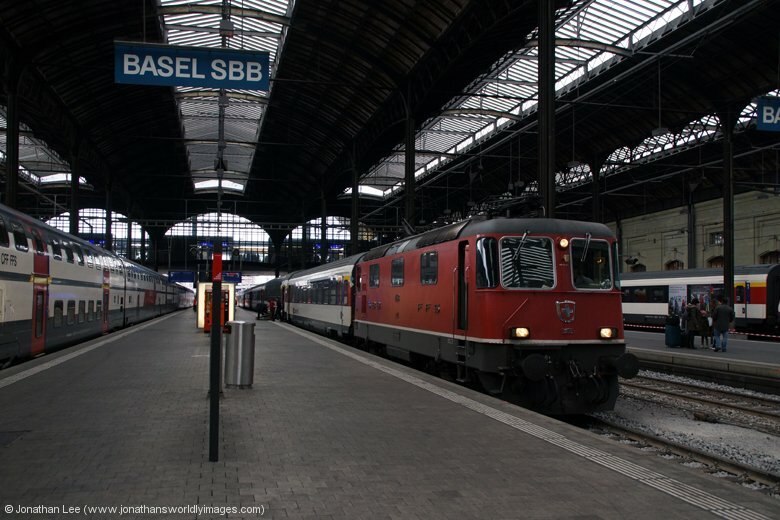 Our train out was SBB’s IC982 1600 Interlaken Ost – Basel with Re460 460041; one of the many Re460’s in an advertising livery. At Spiez the view from outside the station, across the lake, had improved immensely from the morning and we had a few moments to admire it before heading back through the hills to Visp with SBB Re460 460117 on IC828 1341 Romanshorn – Brig; this afternoon’s step-back at Visp at least offered a new MGB loco, in the form of Deh4/4 II #91. 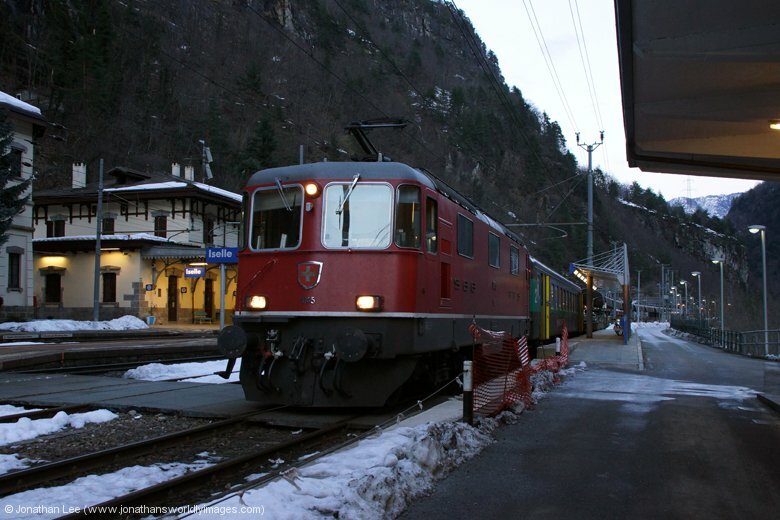 A quick return trip to Visp afterwards also offered up two new Re460s; at which point we were going to call it a day. 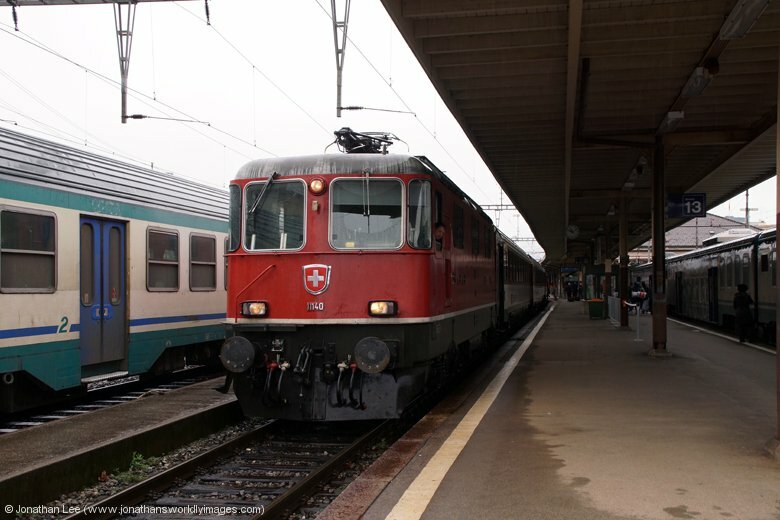 Upon arrival back into Brig we found SBB Re420 11108, in the old style livery, sat in the platform, which would form RE4789 1844 Brig – Domodossola. It didn’t take me long to figure out from the Re420 diagrams that if I didn’t get 11108 in that evening that it “shouldn’t” turn up on any train we planned to do during the rest of our trip; luckily for me I have a very understanding girlfriend who agreed that an evening trip to Domodossola made sense! 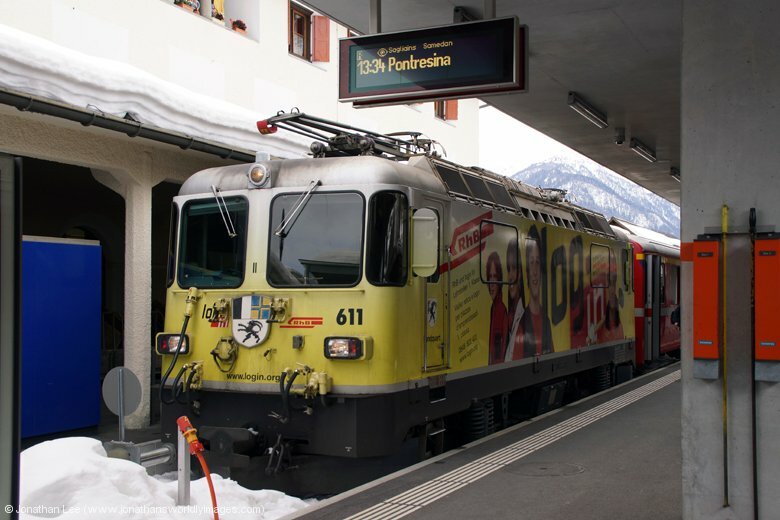 The bonus of that being that there was a SuO IR10056 1941 Domodossola – Bern straight back which was Re460 460009; and only had us and the train crew on it. The train crew for it having worked RE4789 in from Brig. Not such an early start on this morning allowed us plenty of time to do breakfast at the hotel; which has an excellent selection to choose from and has plenty of decent sized bread and cheese/ham to allow us to make up some sandwiches for the day’s lunch; which certainly makes life a bit easier, both on the pocket and doesn’t limit the afternoon when trying to find somewhere to eat. 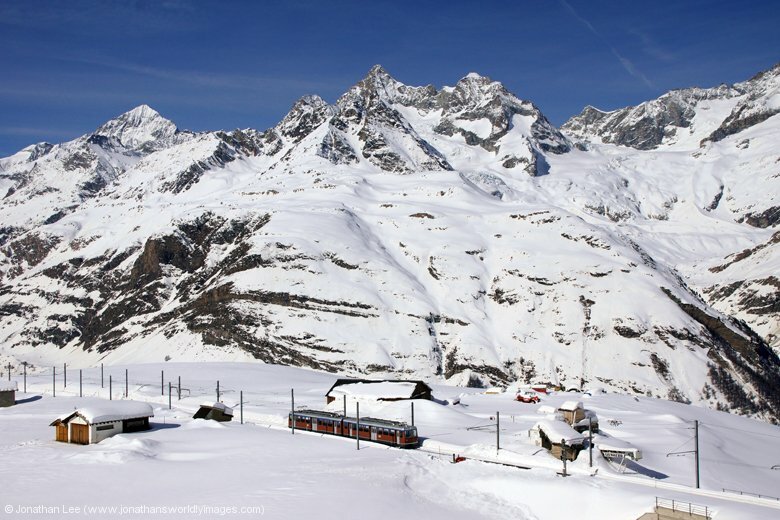 Our original plan was to visit Eggishorn, Bettmeralp & Riederalp but it seemed that only Eggishorn was really accessible to tourists during the ski season with viewing points at the others being off-limits or closed; so Eggishorn it was. 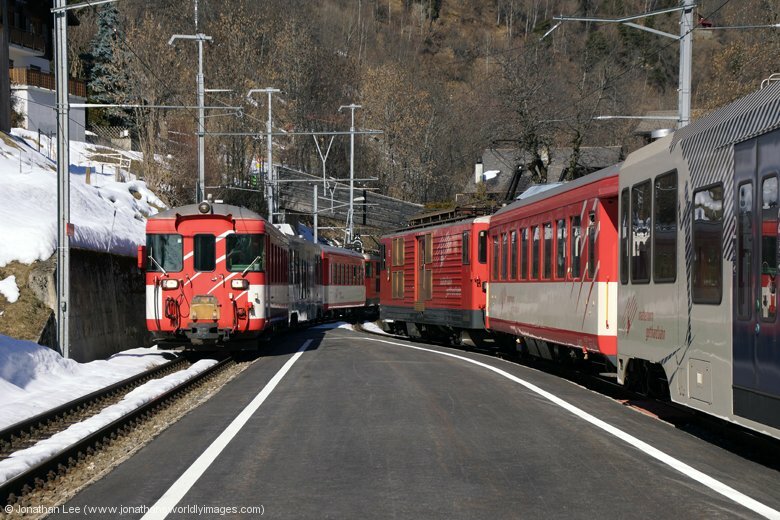 A quick move to Visp offered up two new Re460’s before we headed off to Fiesch on MGB with Deh4/4 I #55. 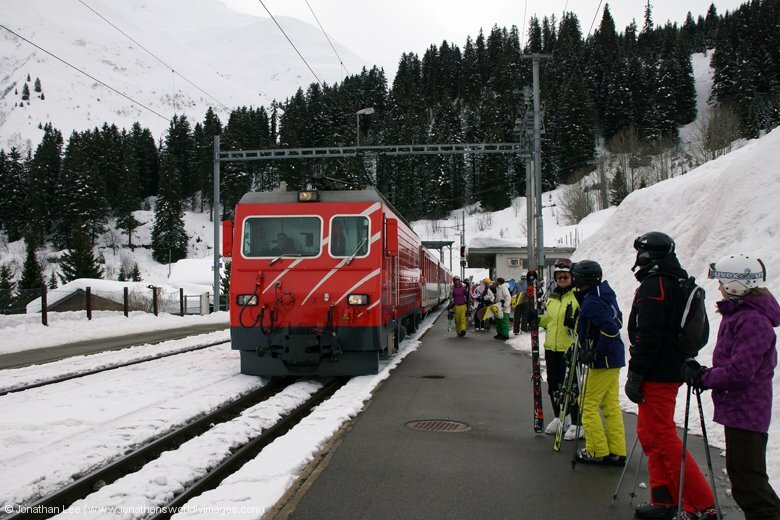 Boarding at Brig ultimately resulted in us having to stand for a couple of stops as the train was wedged with ski folk again. We made the mistake of getting into a reserved coach at first and by the time we’d realised and got into a different one it was standing room only by that point! We got seats eventually though. 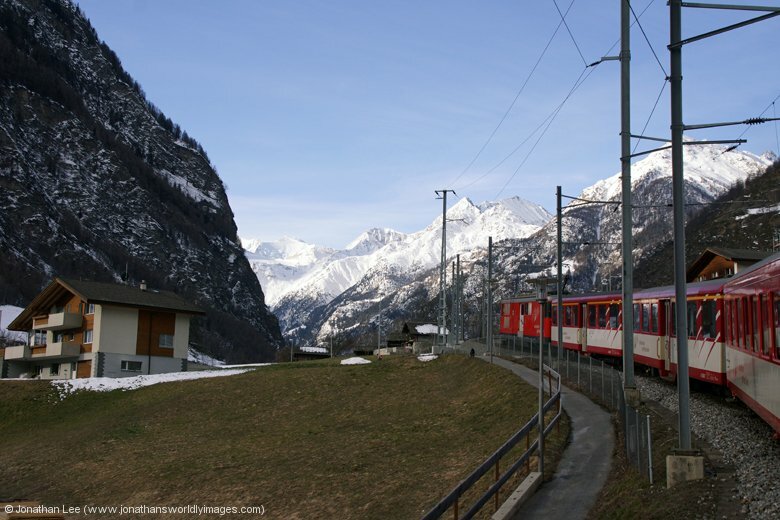 Having only spent a couple of hours from departing Fiesch on the gondola, to departing on a Brig bound train, the afternoon was spent doing Brig – Visp – Brig moves on both SBB & MGB trains; more of the latter than the former. 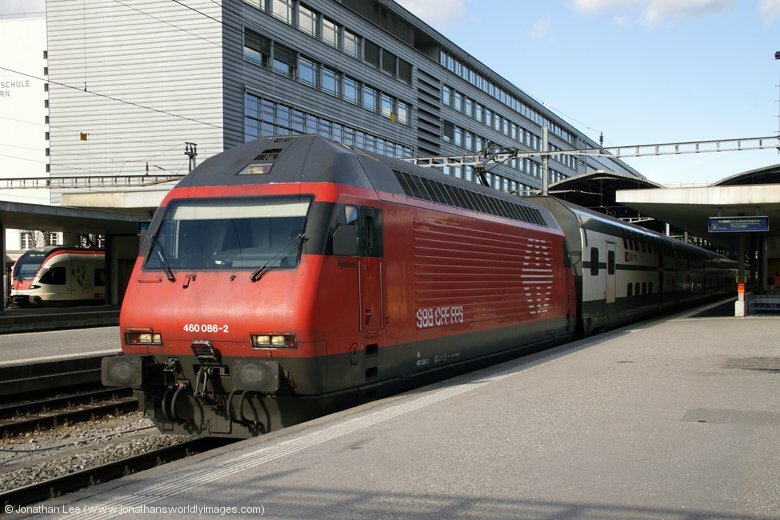 The bonus of the afternoon being SBB Re420 11164 working IR1423 1428 Brig – Geneva Airport vice Re460. The evening was topped off nicely with a trip to Italy again, this time only to Iselle di Trasquera, at the opposite end of the 19km rail tunnel that linked Switzerland with Italy. SBB Re420 1138 took us there on RE4787 1744 Brig – Domodossola; on board which were a raft of Italian border security and police doing random checks on board as they walked through the train. I hadn’t thought much of it at the time but the same crew had been on board 11108’s train the previous night and had some guy’s bag emptied completely that night. The train was empty though but the one we were on, on this occasion, was full of people commuting back to Italy after their day at work so they were spared the whole bag emptying scenario. We had to wait at Iselle for 11138 to depart until we could cross the tracks to the platform where the Auto-train departs from; which was waiting with Re420 11145. The train has one coach for passenger accommodation, next to the engine, which only had us and three guys who turned up just before departure in it. A relatively early finish, compared to the previous night, allowed us to relax a little and savour our time at the Channa Restaurant that night. Another more relaxing morning, again with sandwiches for the day being made at breakfast! We’d been to Gornergrat on a previous trip but no managed to see the Matterhorn due to it being cloudy so we opted for a second visit on this day and a cracking option it turned out to be. 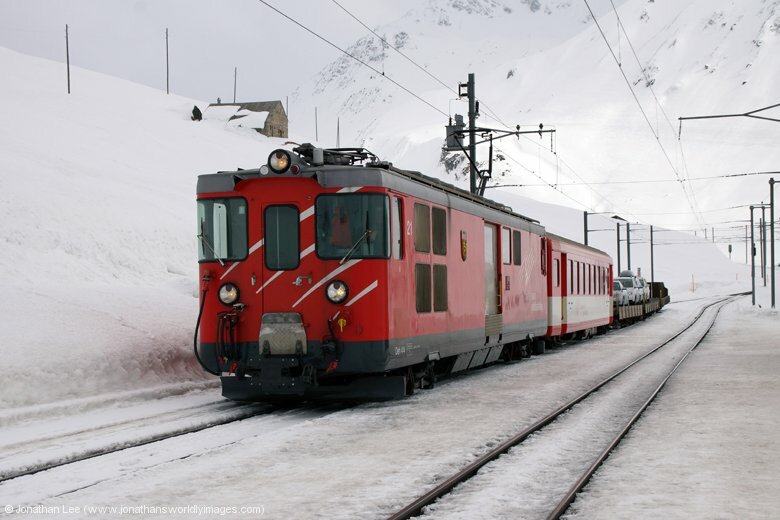 The 2012 MGB diagrams held up well on the Zermatt line with everything being loco-hauled that should be and the Deh4/4 I turn working as booked with #23 working the 0843 Visp – Zermatt for the second day in a row. 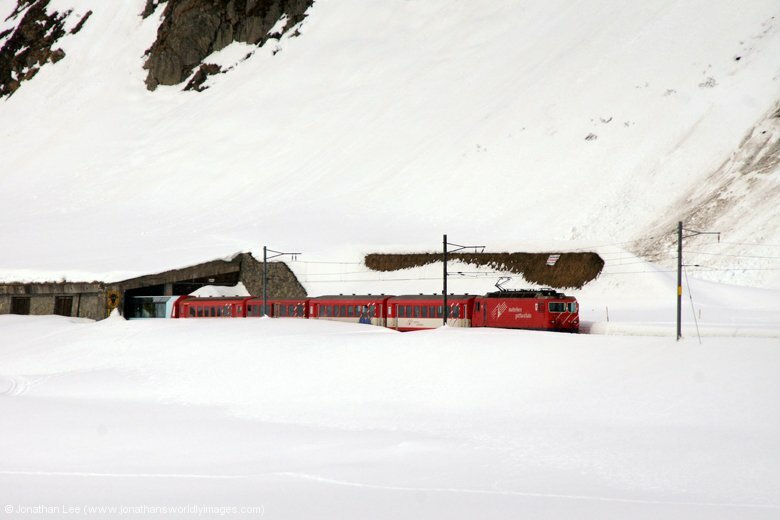 There was a lot more snow about in the valley than on our previous visit to Zermatt and the train wasn’t full at all; allowing me access to both sides as we skirted down the valley. 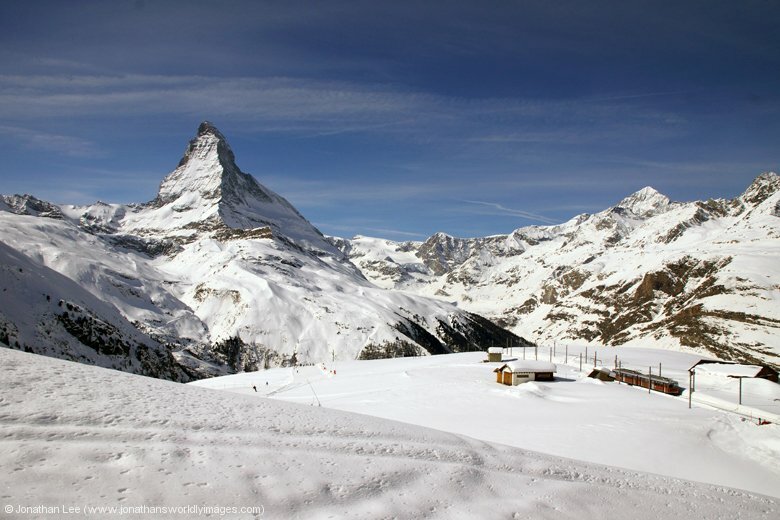 By the time we reached Zermatt the sun was out and for the 3rd day running we were treated to crystal clear, blue skies. 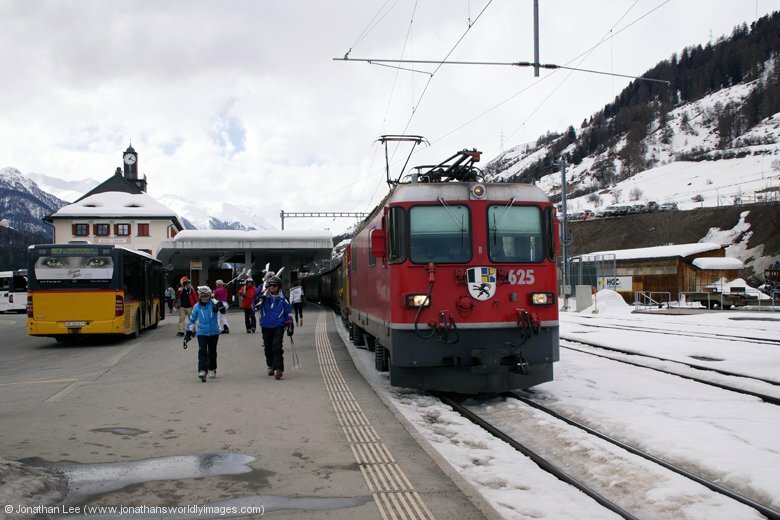 Trains from the Gornergratbahn (GGB) station at Zermatt were a lot busier than on our previous visit, mainly due to the amount of skiers about. 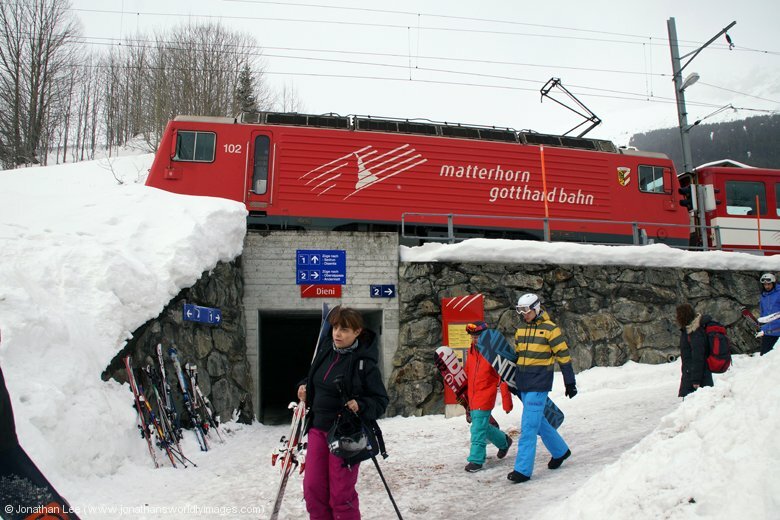 Queues at the ticket office were virtually nonexistent though as most had ski-passes; it didn’t stop one ignorant skier jumping the queue as we waited though, which my girlfriend was having none of and told her exactly what she thought of her act! It was the tipping point as far as putting up with ignorant skiers had gone over the last three days…..
Tickets on the GGB aren’t anywhere near as costly as the trip to Jungfraujoch and again a Swiss Pass will get you a 50% discount; the full fare ticket being CHF74 and with the Swiss Pass CHF37 for a return journey. 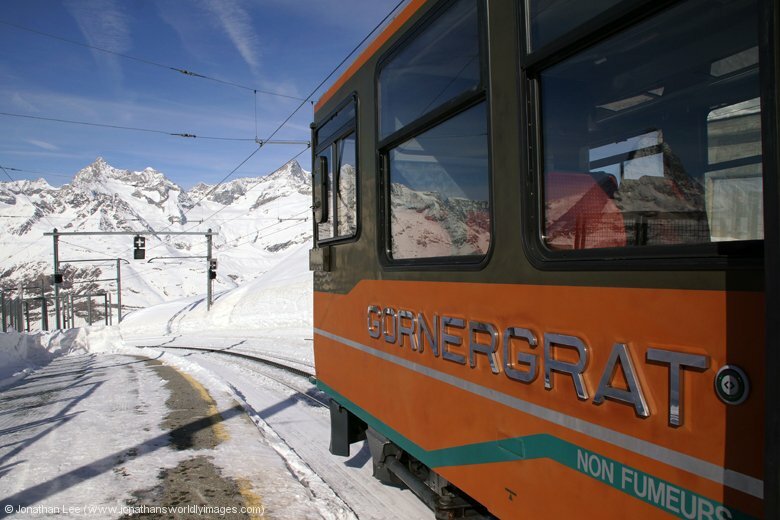 During the ski season there are multiple departures at the same time (following each other) with one train being express to Gornergrat and the next stopping all stations. The expresses are worked by the new 1993 built Bhe4/8 & Bhe4/6 units while the stoppers were worked by Bhe4/4’s and the various ski trains by the old 1965 built Bhe4/8’s. 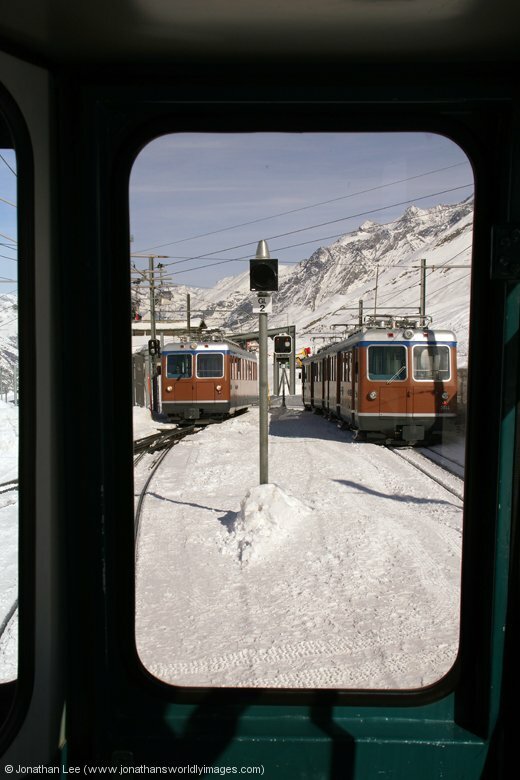 Having flagged the 1000 departure to Gornergrat, as there were no seats left, we were first through the doors onto the 1024 express departure; which departed full and standing. 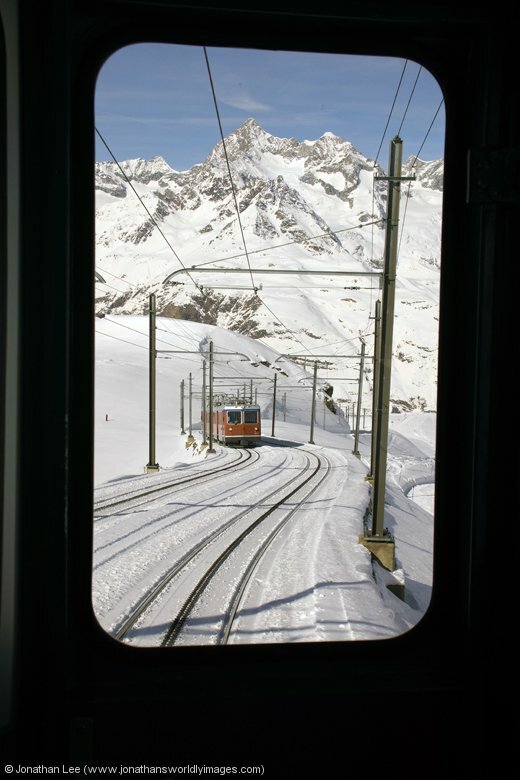 The view from the right hand side on the way up is the best and the Matterhorn is clearly visible immediately after the train starts climbing above Zermatt and crops up at various points during the journey. There are some excellent views down the valley towards Visp from the left hand side at Rifelalp though. 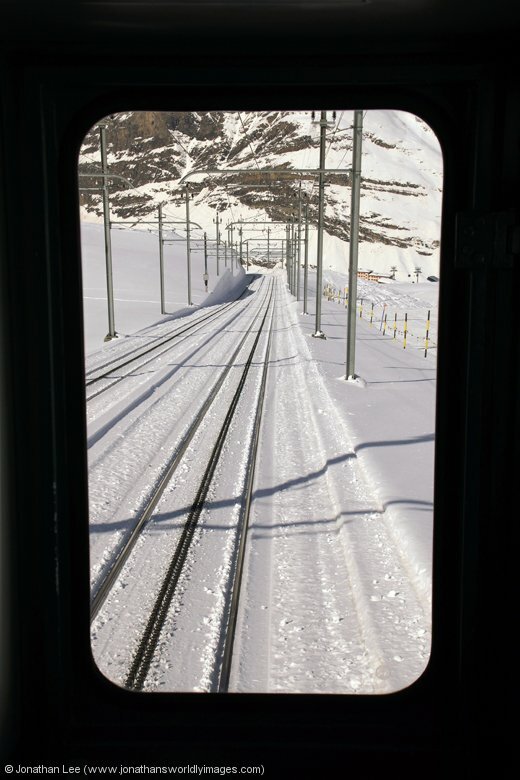 A cracking trip out with the journey back down to Zermatt being the better of the two as we had most of the train to ourselves and a birds-eye view out of the driver’s window at the front of the train. 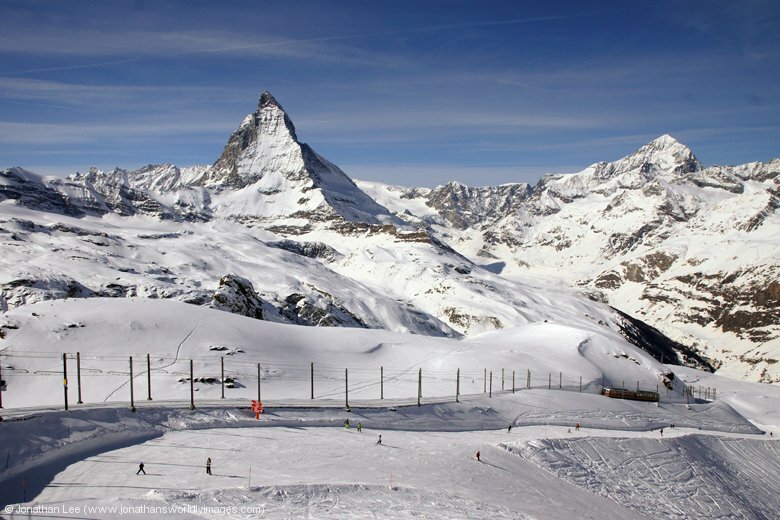 The picture-postcard views of Zermatt, with houses that had 2ft of snow coating their roofs, with the Matterhorn in the background were well worth holding your breath to take! A nice warm cup of hot chocolate in the restaurant by the station was just what the hands needed after a short walk up the main street in Zermatt. 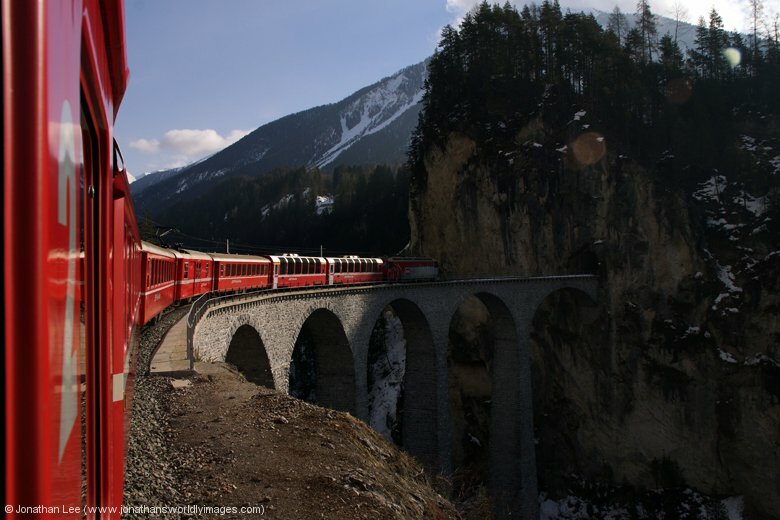 MGB HGe4/4 II #3 was the 1339 Zermatt – Brig, as predicted from the morning viewings and dropped us into another afternoon of Brig – Visp – Brig moves on both SBB & MGB trains; unfortunately no bonus Re420’s on this afternoon. 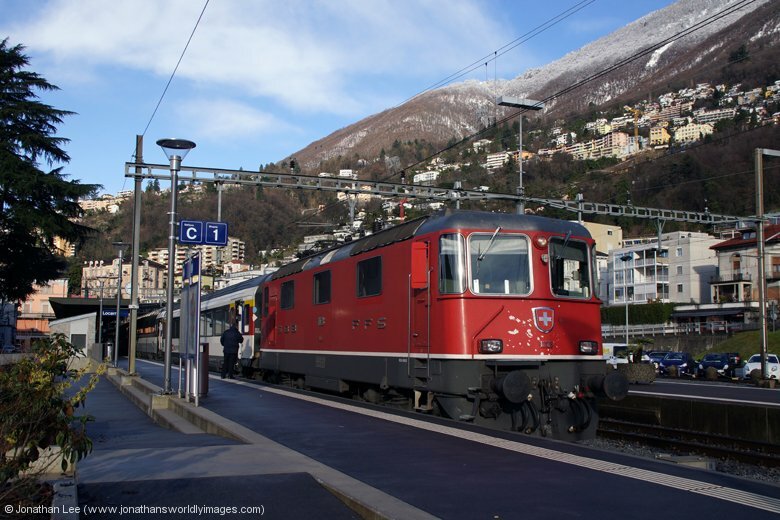 I’d been planning the same afternoon move as we’d done the day before but for some reason SBB Re420 11108 had found its way onto RE4787 1744 Brig – Domodossola, clearly not having stuck to diagram, so we ended up doing Re420 11136 out and back to Iselle on the 1736 Auto-train departure. The guard on board which was a friendly chap and was quite surprised when we returned from Iselle with him; giving us all sorts of gen on the tunnels on the journey back. He told us that there were two tunnels, both separate bores, and that they were 19km800y long and not 20km as everyone said they were. He also told us that there was a natural spring on the Italian side which drained into the tunnel and sometimes caused problems with the electrics on the train and made the trains rusty within three years. Back at Brig we opted to make a quick out and back journey to Visp to get some pop from the Co-op just outside the station as it was way cheaper at CHF1.50 than any place in Brig; the cheapest being CHF3.50!!!! It only took us 20 minutes, including getting the pop. IC841 1849 Brig – Romanshorn was T&T Re460s 460115/031; which I’d seen on a Romanshorn train the previous day so assumed that the DVT on the set was knackered as it wasn’t one of the booked trains to have two Re460s. Bidding farewell to Brig we set off for a new base at Chur on MGB’s 526 0808 Visp – Göschenen with Deh4/4 I #52; thankfully the train was quite empty as it was too early for the skiers to be heading out. 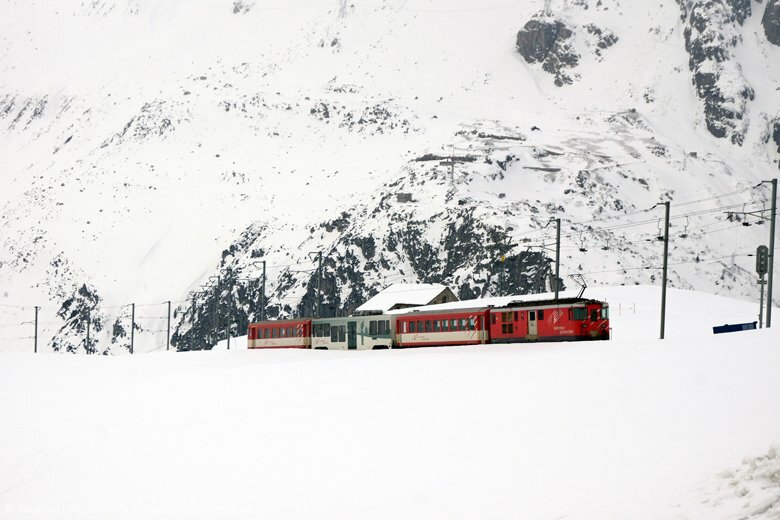 It was a nice journey over to Andermatt, where the fun began. 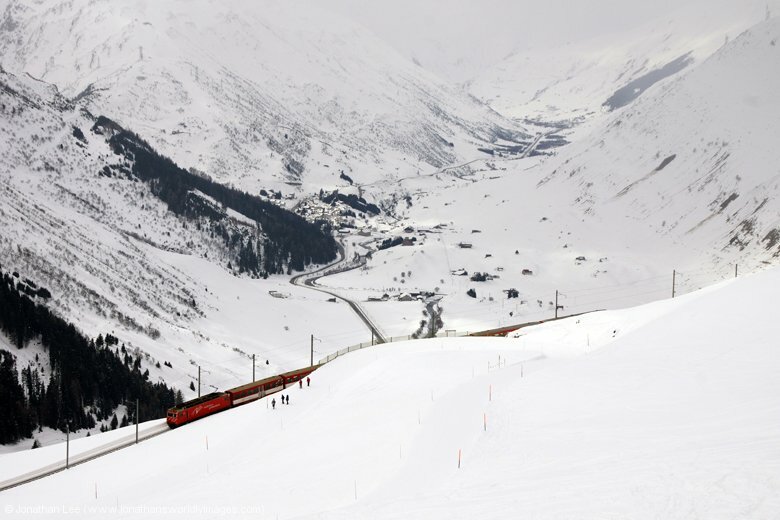 During our first trip to Switzerland, on board a Glacier Express train, I’d noticed that there were photo opportunities of trains climbing from Andermatt to Nätschen; either from Andermatt at the bottom of the hill or Nätschen at the top. This day had been planned with getting those very photos in mind; and to enjoy a bit of the open countryside, surrounded by nothing but snow and mountains! 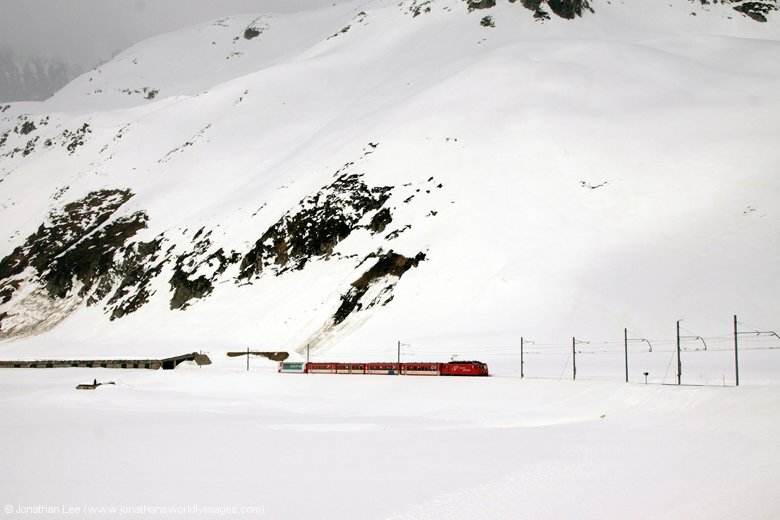 From Andermatt we were straight up to Nätschen with MGB HGe4/4 II #104 on 828 1027 Andermatt – Disentis. MGB Deh4/4 I #53 was sat in as we arrived ready to head towards Andermatt ecs, having worked out to Oberlappass with 826 0855 Andermatt – Oberalppass ski train; this made for some excellent photos as it descended to Andermatt, the whole valley towards Visp being visible from the end of Nätschen station. Unfortunately the weather wasn’t as good to us as it had been on the previous three days and it was completely overcast. 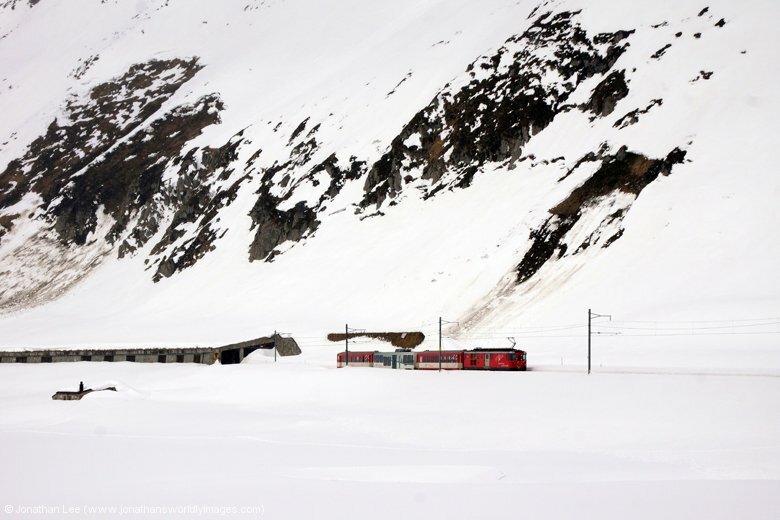 We waited in the peaceful mountain surroundings of Nätschen for #53 to return with 830 1055 Andermatt – Oberalppass ski train and did it forward to Oberalppass; which was even more peaceful than Nätschen, and more of a whiteout. 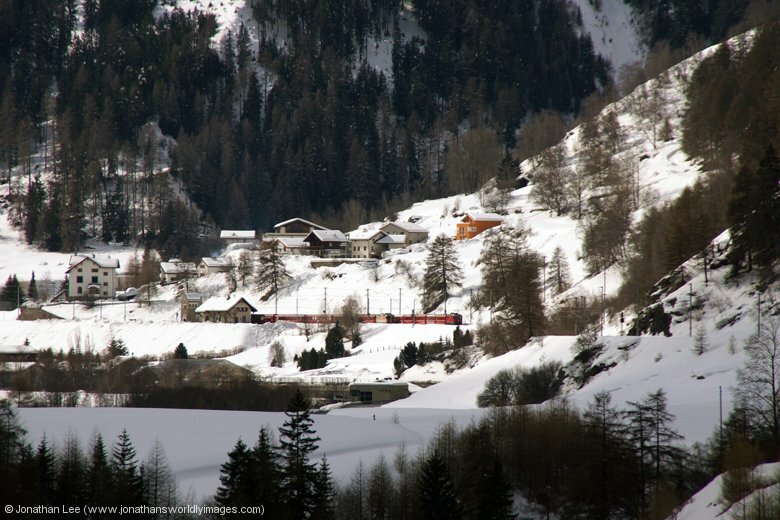 After photographing #53 departing ecs to Andermatt I went to explore the surrounding area, behind the station. There was a restaurant, which I could hear music coming from, and a few homes which had been almost buried in recent snowfalls. 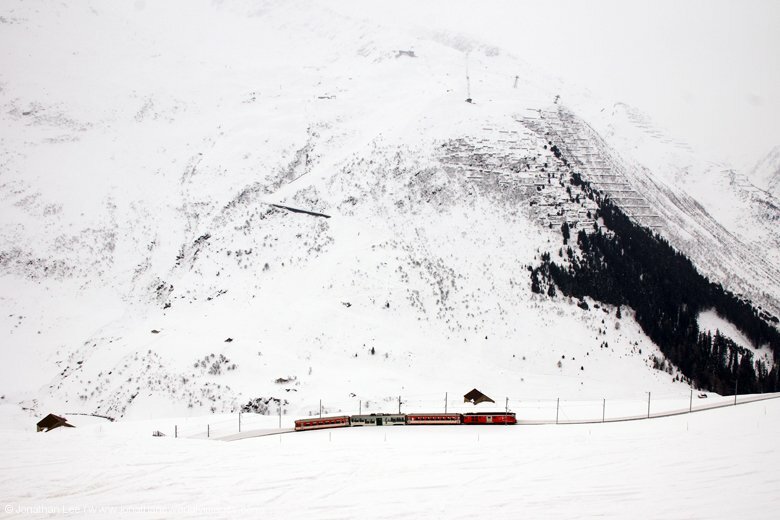 Other than that we were completely isolated from the real world; until a couple of skiers arrived off a ski-run that finished at Oberalppass station. 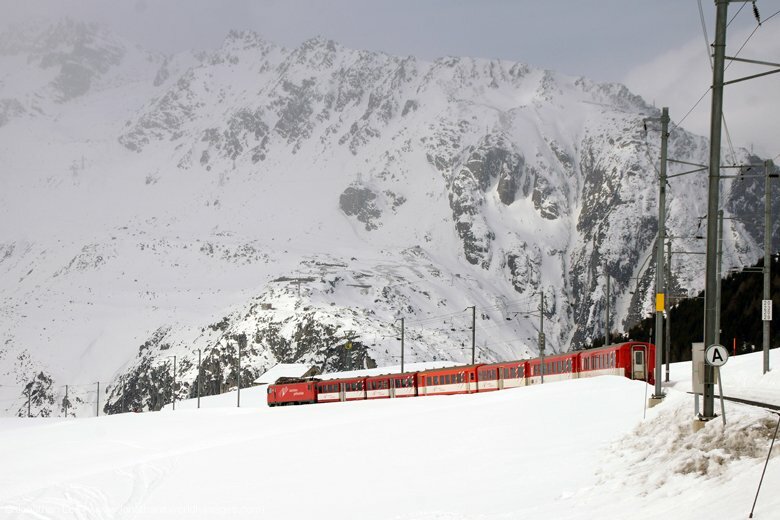 We headed back to Nätschen with MGB HGe4/4 II #107 on 831 1114 Disentis – Andermatt, where plenty of photo opportunities presented themselves. 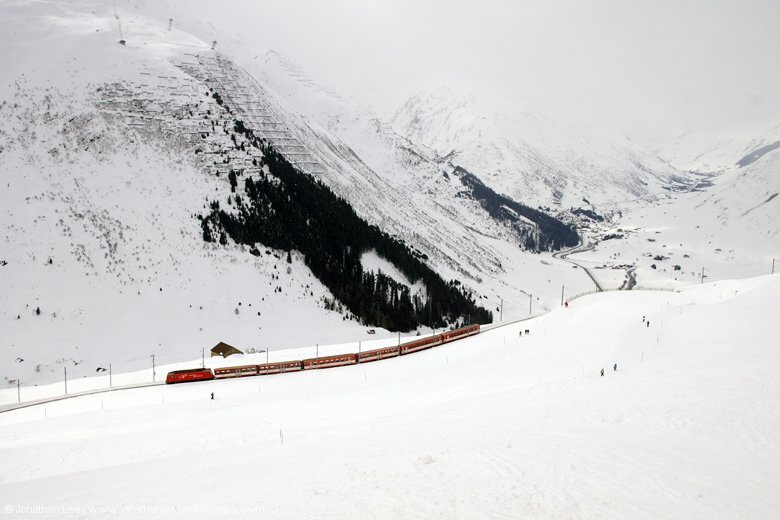 #107 running down the hill to Andermatt with train 831 for starters then Deh4/4 I #21 arrived with the 1150 Sedrun – Andermatt car train and sat waiting trains to cross it before heading down to Andermatt; after we’d departed. 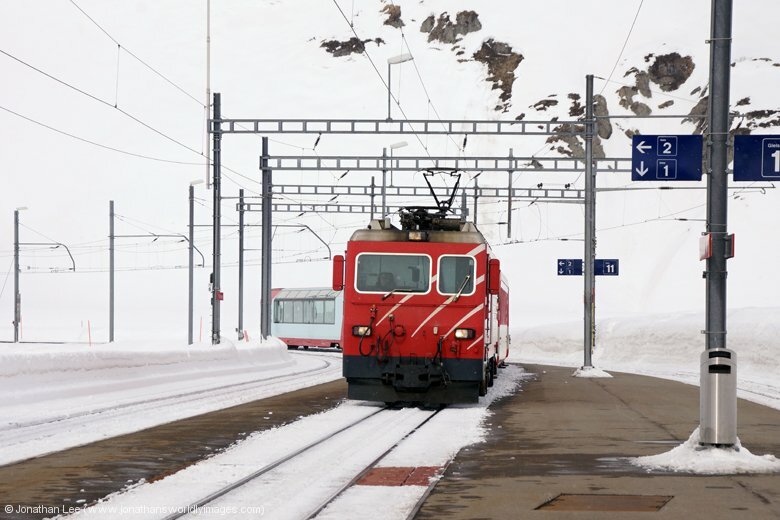 HGe4/4 II #1 then passed through with Glacier Express train 902 0852 Zermatt – St Moritz before our train to Disentis arrived with HGe4/4 II #105 heading train 836 1227 Andermatt – Disentis. It had begun to snow before we departed Nätschen and yet the sun tried to poke through the cloud as we headed through the white countryside towards Oberalppass. By Dieni the snow had stopped and the cloud became more broken with the sun gleaming through at various points; it being hidden behind cloud again by Sedrun. By Disentis though snow was only visible on the peaks of the surrounding mountains and the cloud was starting to dissipate; making for a nice, yet cool, afternoon on the Rhatische Bahn while making our way to Chur. 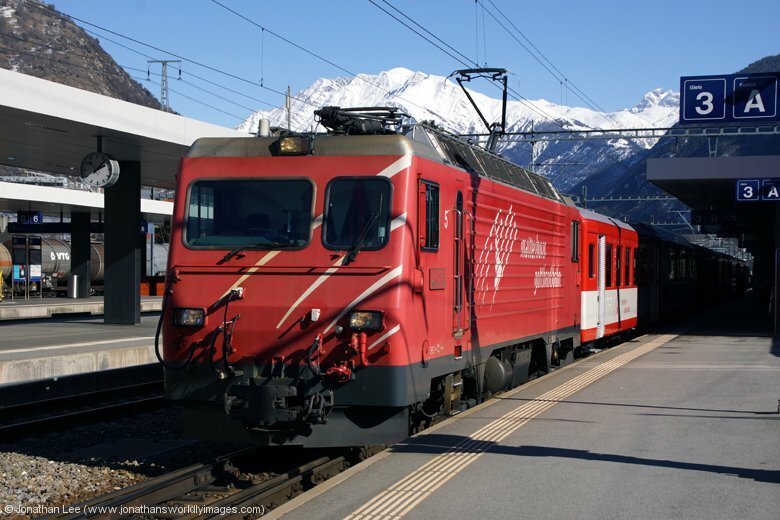 RhB Ge4/4 II #629 was sat waiting for us at Disentis with RE1253 1344 Disentis – Scuol-Tarasp and the 3 minute connection from our MGB train was no problem at all. 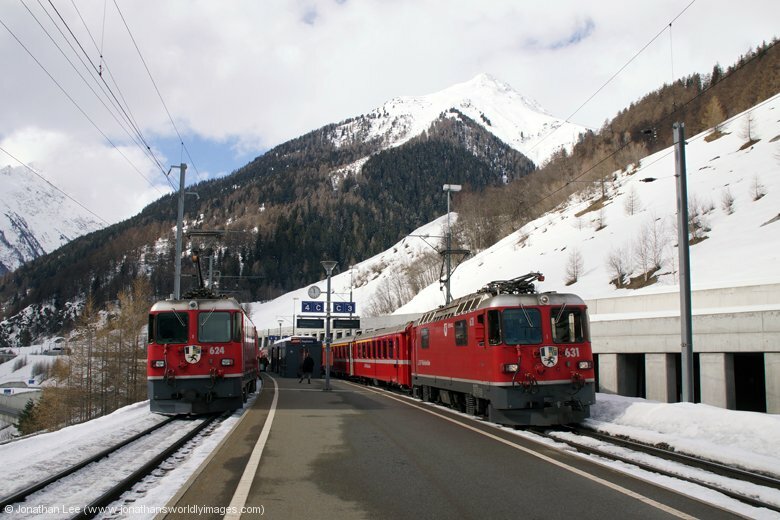 We passed Ge4/4 II #616 at Rabius-Surrein heading towards Disentis and got off at Ilanz to double back to Trun for it; Ge4/4 II #627 heading RE1236 1140 Scuol-Tarasp – Disentis back to Trun. 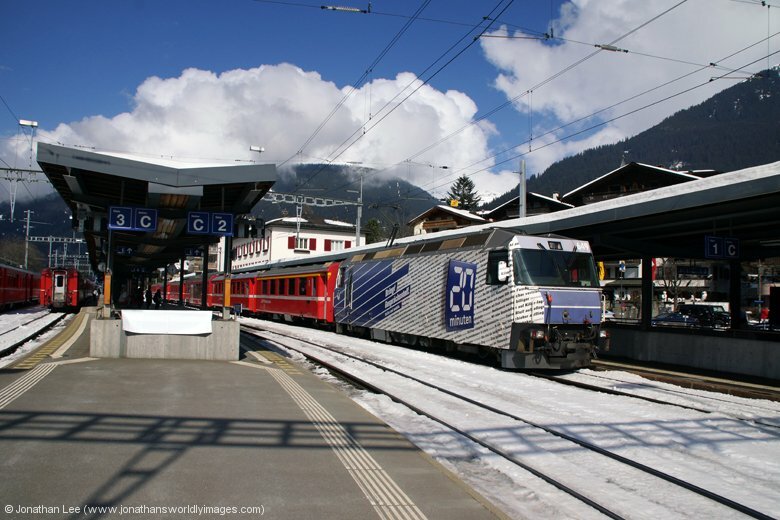 I couldn’t resist one more spin move on the way into Chur; which unfortunately wasn’t a successful step-back as Ge4/4 III #652 rolled in with RE1148 1402 St Moritz – Chur. 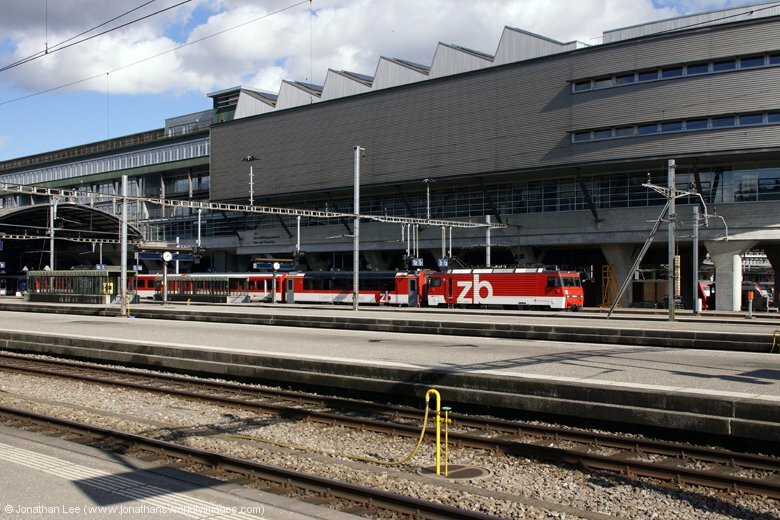 Chur did have one more potential move to offer when we got there but IC10782 1638 Chur – Zürich HB, now the only Re420 turn to Chur at all, was dud 11200 so we went straight to the Hotel Chur. 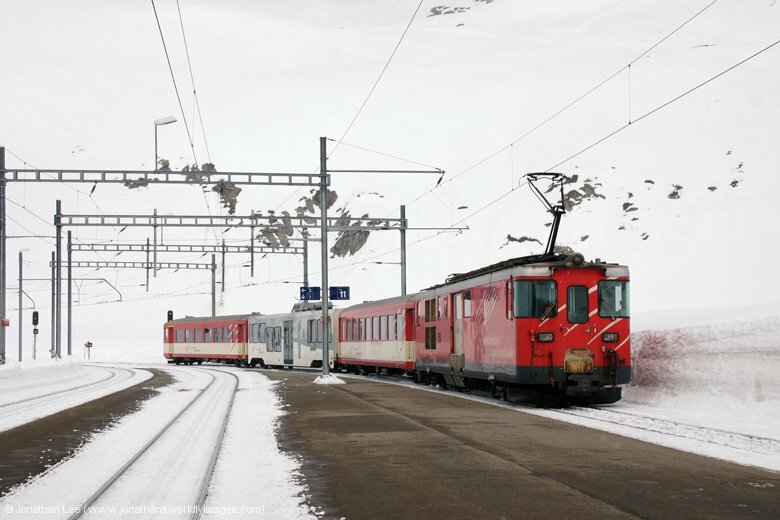 Chur now had a very limited number of SBB hauled trains since the St Gallen RE’s went over from Re420 to EMU and the Basel – Chur IR’s turned into Zürich – Chur RE’s instead, again with EMUs! 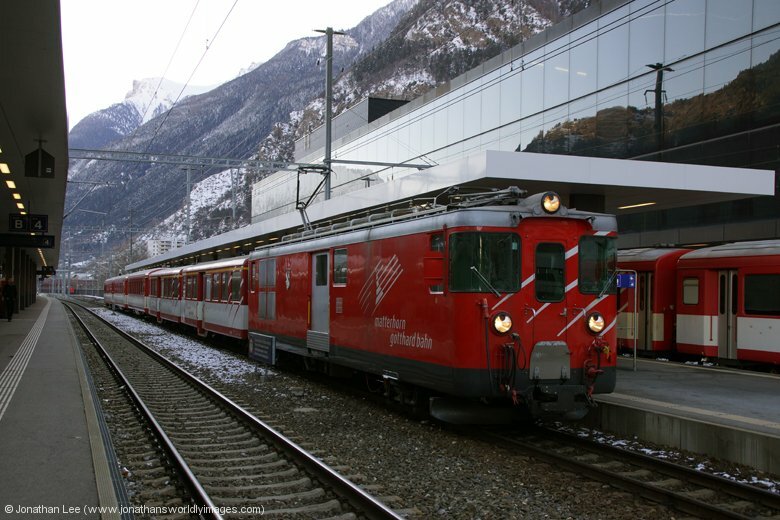 In reality there was only one hauled train an hour in/out of Chur; excluding the RhB stuff of course. 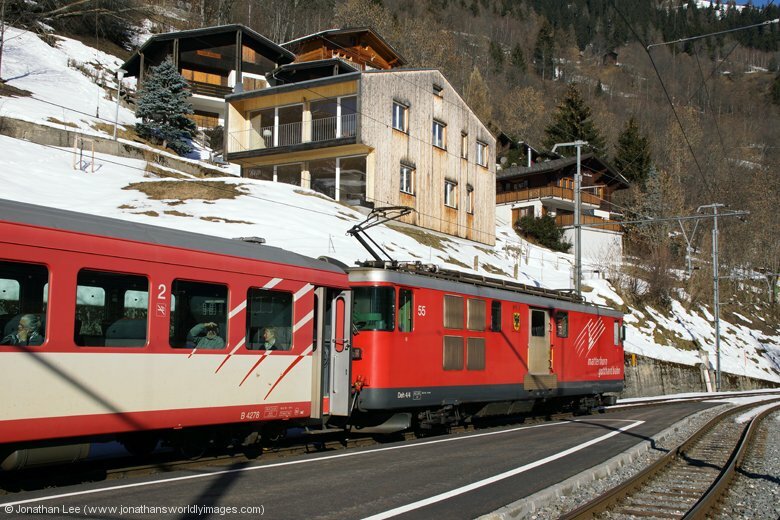 The Hotel Chur is about a 10 minute steady walk away from Chur station; following the RhB Arosa line through the street takes you right to the front door as the line veers off to the left at the roundabout in front of it. For some reason we were given a family room, which had a large enough main room for us and a completely separate child’s room with its own bathroom. 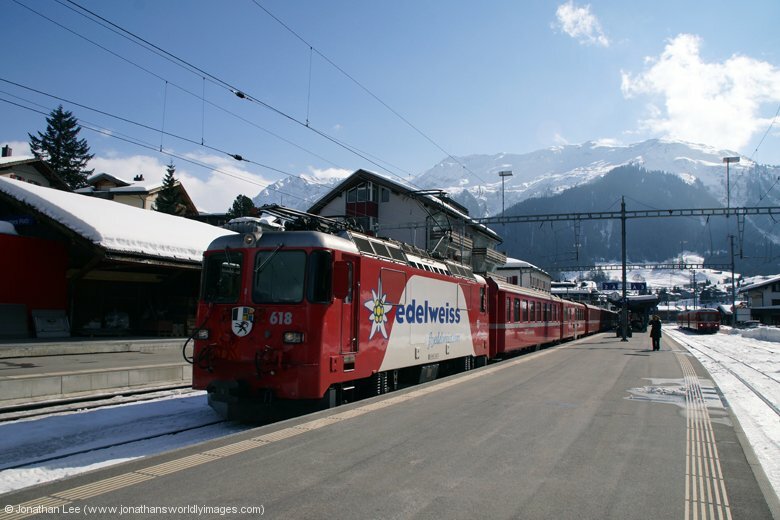 Having had such an early finish I ended up nipping back out on my own for a quick spin move on RhB doing Ge4/4 II #615 to request shack Haldenstein, just out of town, on RE1265 1644 Disentis – Scuol-Tarasp for Ge4/4 II #617 back on RE1256 1640 Scuol-Tarasp – Disentis. I decided to walk back through Chur town centre in an attempt to find somewhere to eat; while there were plenty of places none really stood out as I walked by and we ended up eating at an Italian place called Pizzeria Mamma Mia; it was a little claustrophobic inside, space being quite limited, and the service wasn’t that great in that it took 10 minutes for us to be asked for our order. The food was ok though but nothing spectacular; we ate better the following night. Breakfast at 0715 and a decent one it was too; another hotel with decent bread to make up a good sandwich for later in the day! 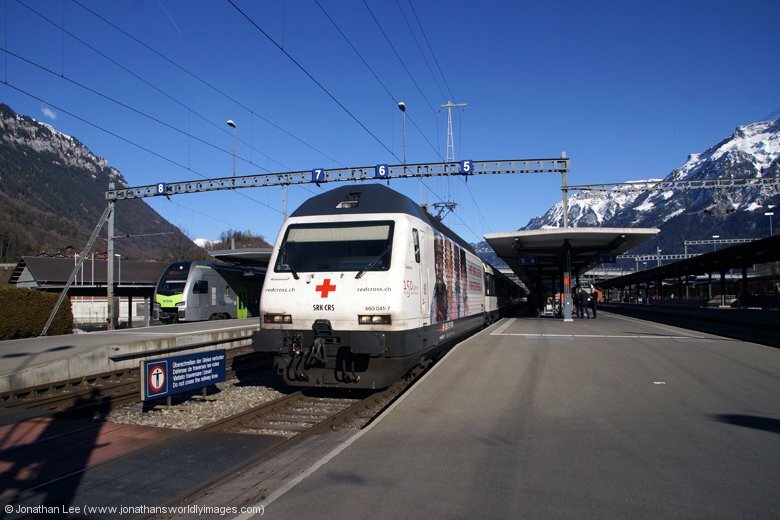 I left my girlfriend at the hotel to get herself sorted while I went out to do a quick move to Domat/Ems and back, which would hopefully net me my first RhB Ge6/6 II on turn 201 which is mixed train 4221 0753 Ilanz – Chur; the only passenger diagram for a Ge6/6 II. 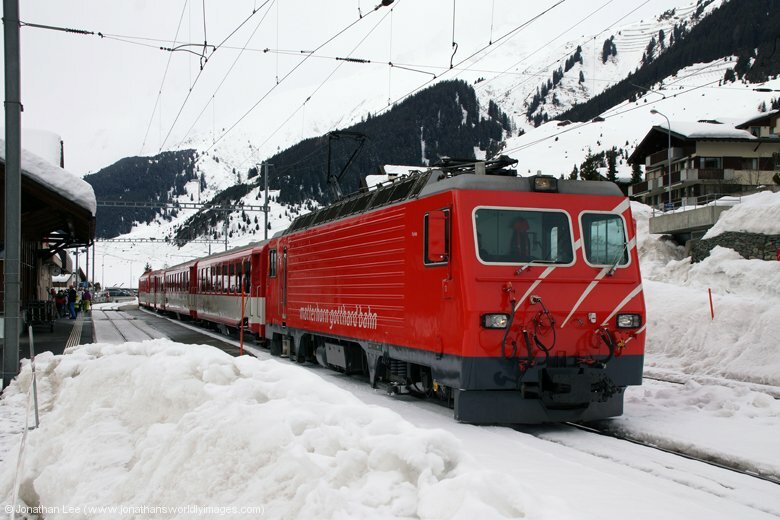 I was off to a good start with Ge4/4 III #645 on RE1121 0758 Chur – St Moritz, which deposited me at an almost deserted Domat/Ems station. 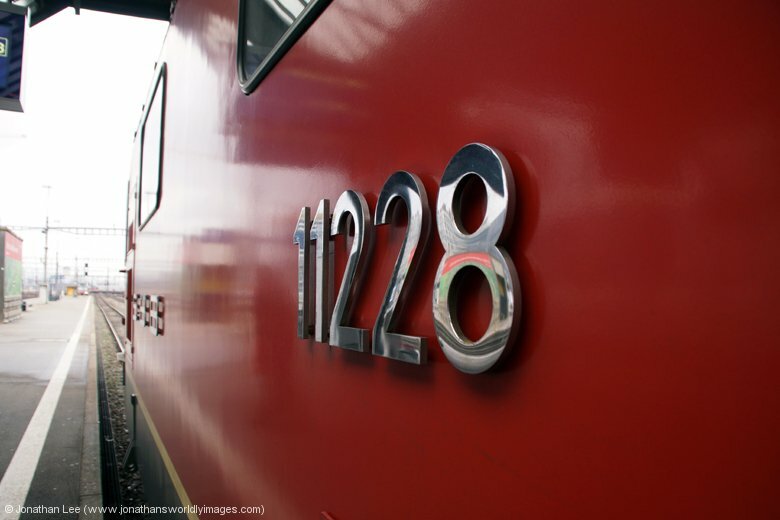 I knew when train 4221 was approaching as the barriers at the platform end went down; the moment of truth! Camera poised, on what was a dull morning as the sun hadn’t got above the mountains yet, I wasn’t disappointed when Ge6/6 II #704 rolled in with two passenger coaches and 7 freight wagons behind those. Three people got on at Domat/Ems, including me, which made a total of six on board; Domat/Ems being the only intermediate stop after departure from Ilanz. Not a well used passenger train at all. At Chur I legged it under the subway to get a photo and only just made it. No sooner was everyone off did the train set off for Landquart; on the next leg of the diagram, which was booked freight only but did have the two coaches with it. Rather than walk back to the Hotel Chur, only to have to return straight away, I met my girlfriend outside the station and then our day began. 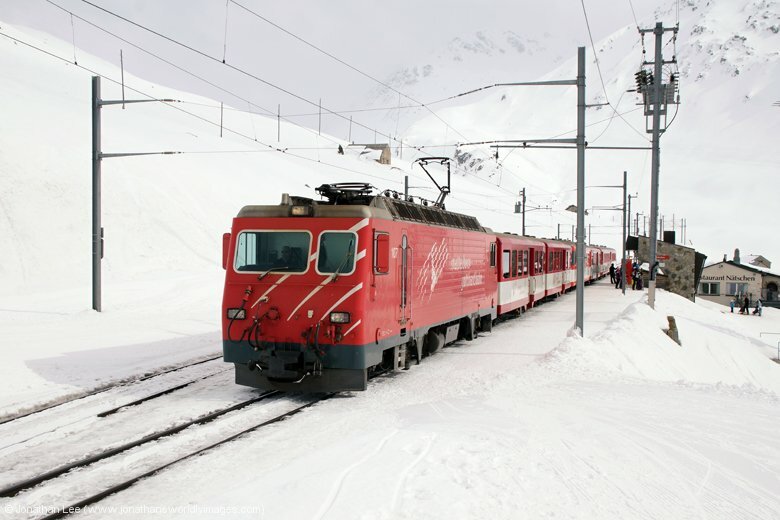 Firstly with Ge4/4 II #612 on RE1216 0817 Landquart – Scuol-Tarasp, only to Reichenau-Tamins, for Ge4/4 III #645 behind on RE1125 0858 Chur – St Moritz to Filisur. 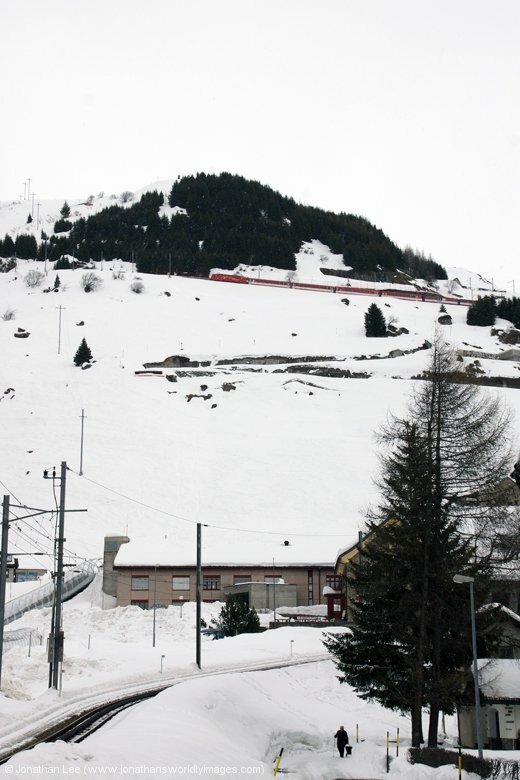 The plan for the day being to cover the remaining bits of the RhB network that had loco-hauled trains and ultimately get to see Scuol Castle and plenty of snow covered scenery en-route. 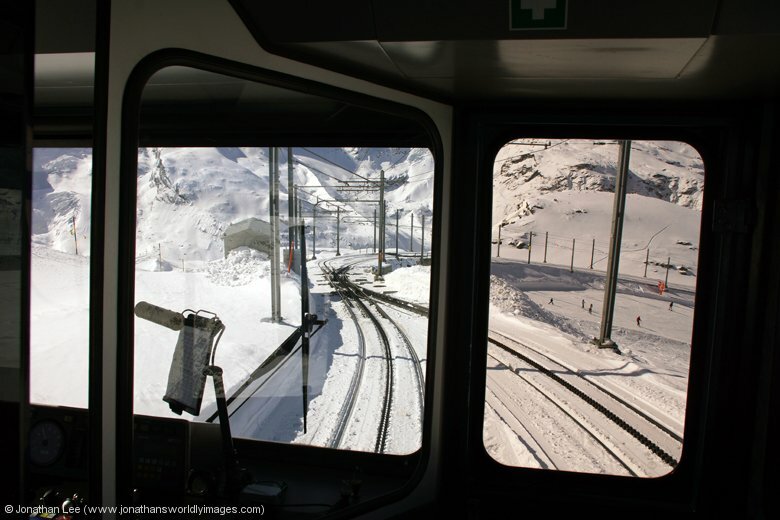 There are only two turns a day that cover the Filisur – Davos – Klosters section so that dictated how the move planned out really; especially as both the Davos – Klosters ski trains had been reported as EMU’s vice Ge4/4 II; which was exactly what they were when we spotted both turns! From the moment we left Reichenau-Tamins the build up of snow got greater the nearer we got to Filisur and the day got brighter as the sun began to actually make some headway into the sky. It was a lovely atmospheric morning as we ambled through the valley with clouds dancing around on top of the mountains with some lower cloud lingering in the valley and a nice clear blue sky back-drop to top off the morning. 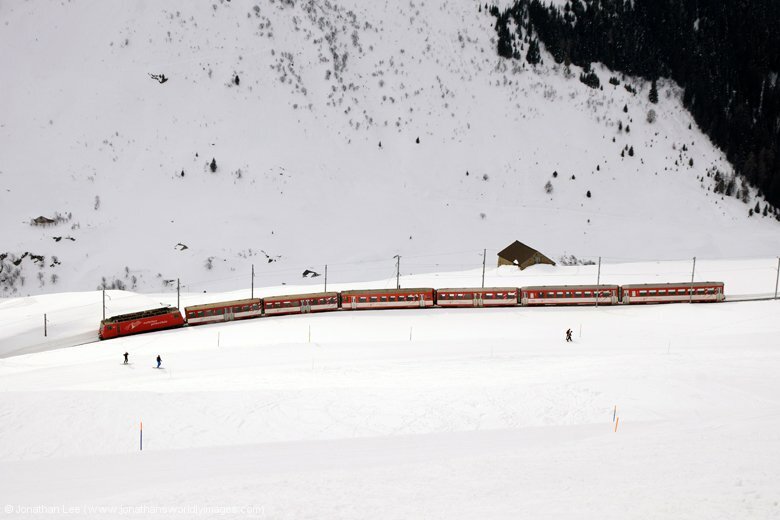 RhB Ge4/4 II #648 was waiting at Filisur for us and whisked us to Davos Platz in no time; where the snow cover was far greater than at Filisur, with people ski-walking on the flat, right beside the station on the opposite side of the stream. 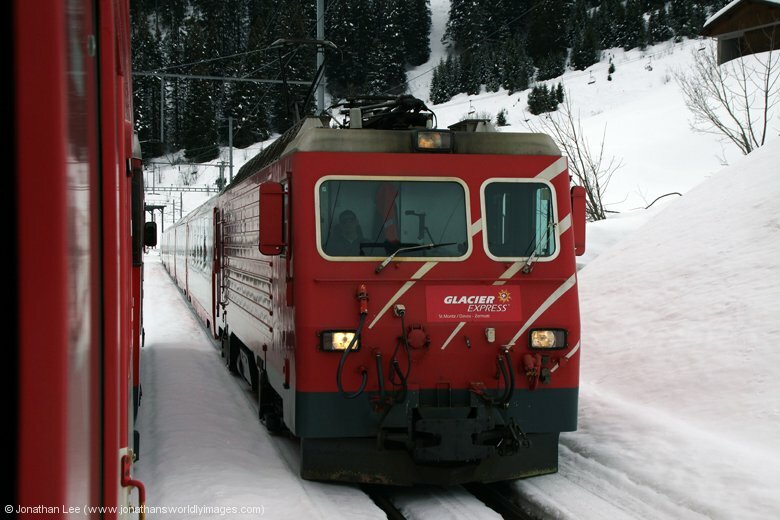 As the connecting ski train to Klosters was an EMU vice Ge4/4 II we had 30 minutes at Davos Platz; during which time RhB Tm2/2 #120 shunted 4 additional coaches onto the rear of the set we’d just arrived on, thus sandwiching Ge4/4 III #648 in the middle of the train; which then formed our train forward to Klosters, RE1032 1102 Davos Platz – Landquart. 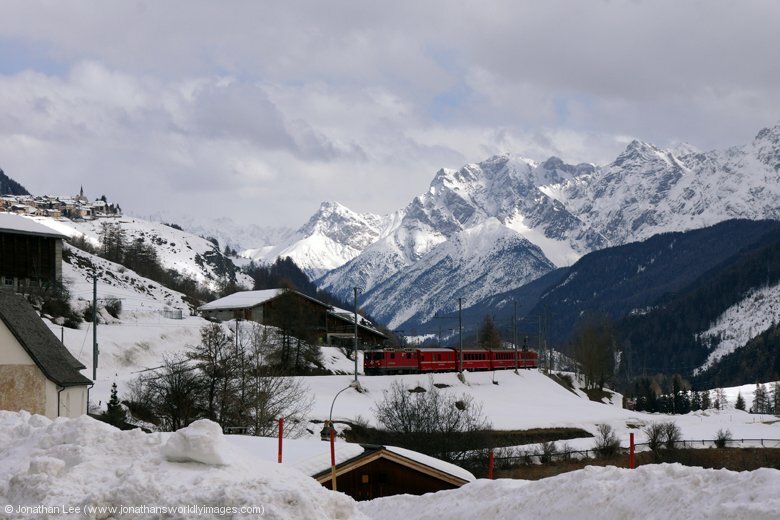 The run from Davos to Klosters offered up the best snow scenery of the morning and we almost ended up in the clouds before dropping into Klosters Platz where we stepped off our train, crossed the platform and boarded our connecting train towards Scuol-Tarasp with RhB Ge4/4 II #631. The run to Sagliains is completely scenery free as it’s within a tunnel the whole way. 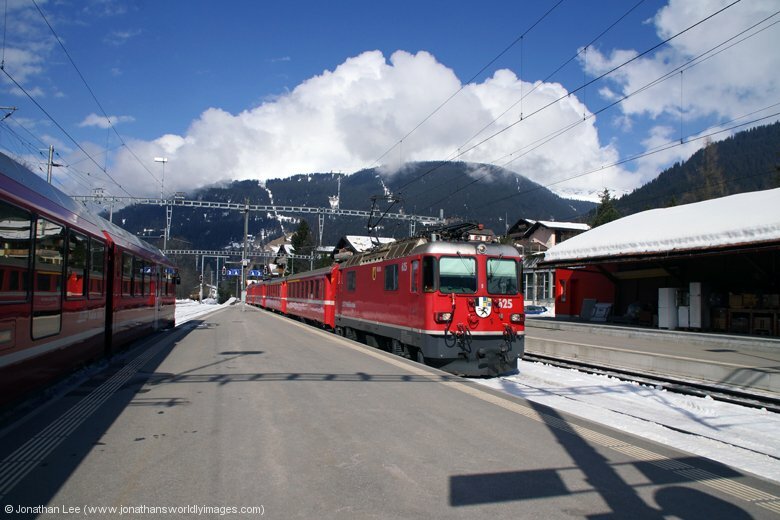 We ended up returning straight back to Klosters as Ge4/4 II #618 arrived with RE1236 1140 Scuol-Tarasp – Disentis, on a turn that we wouldn’t see again for the rest of the day; unfortunately the engine we then ended up on all the way to Scuol-Tarasp was one of the three Ge4/4 II’s I’d already had, #625 on RE1237 0944 Disentis – Scuol-Tarasp. 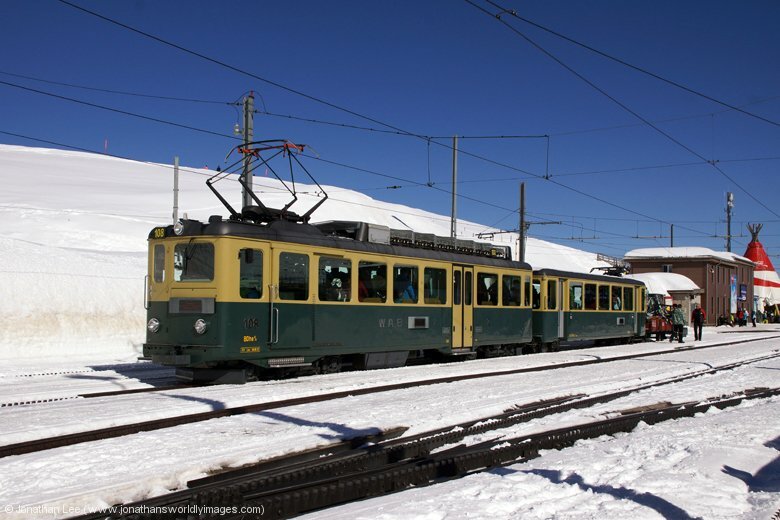 Having seen all the Ge4/4 II’s on the Pontresina circuit and only needing one of the three, along with some of the others on the Disentis circuit a plan was hatched to get us back to Chur. 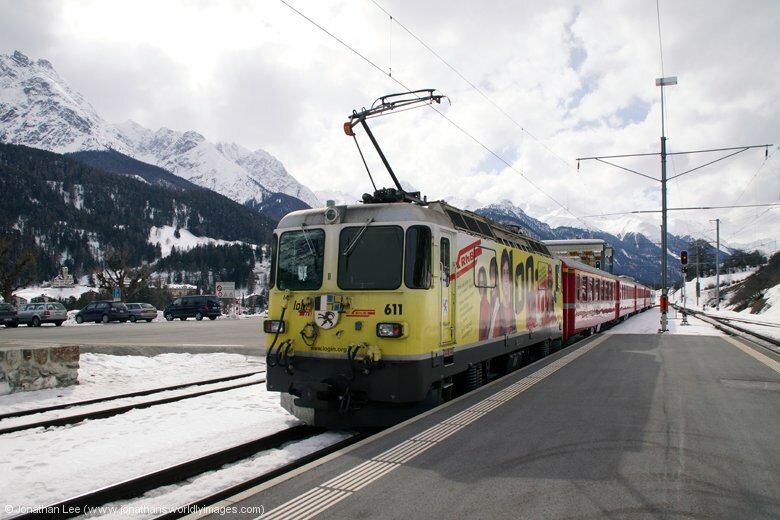 This involved doing Ge4/4 II #624 to Sagliains on 1945 1434 Scuol-Tarasp – Pontresina for Ge4/4 II #612 behind it to Klosters Platz on RE1248 1440 Scuol-Tarasp – Disentis. 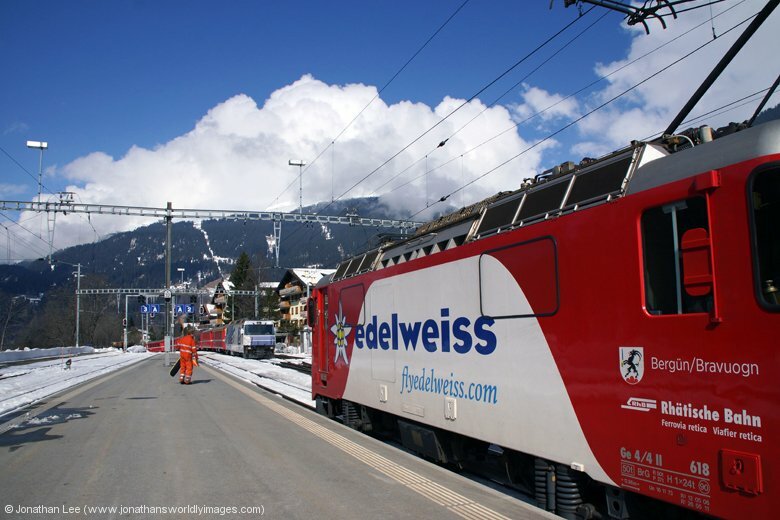 An opportunity then arose to get the other Ge4/4 III in on the Landquart – Davos – Filisur turn, which happened to be a new #649. Having got off 649 at Küblis a double-back was in order so we could get Ge4/4 II #632 in on RE1253 1244 Disentis – Scuol-Tarasp. 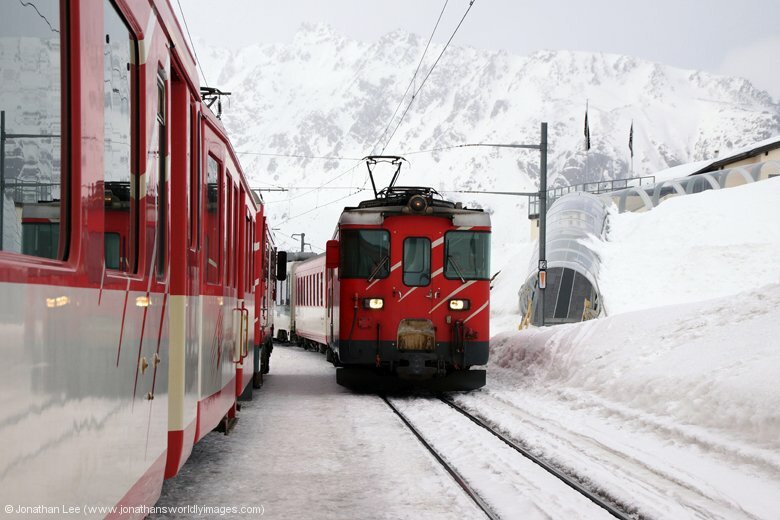 As the trains crossed at Klosters we didn’t risk it and got off at request stop Saas, in the middle of nowhere with its own restaurant on the station platform. At request stops there’s a button to press that gives the driver of approaching trains an indication that there’s someone waiting; thankfully I found this while milling about on the platform! Ge4/4 II #627, which we’d had the previous evening, whisked us back to Landquart on RE1252 1540 Scuol-Tarasp – Disentis where the next SBB loco-hauled train to Chur could be made at Sargans off the outbound loco-hauled train of the hour! It was of course Re460 for Re460 but one of them was new so it wasn’t wasted time. 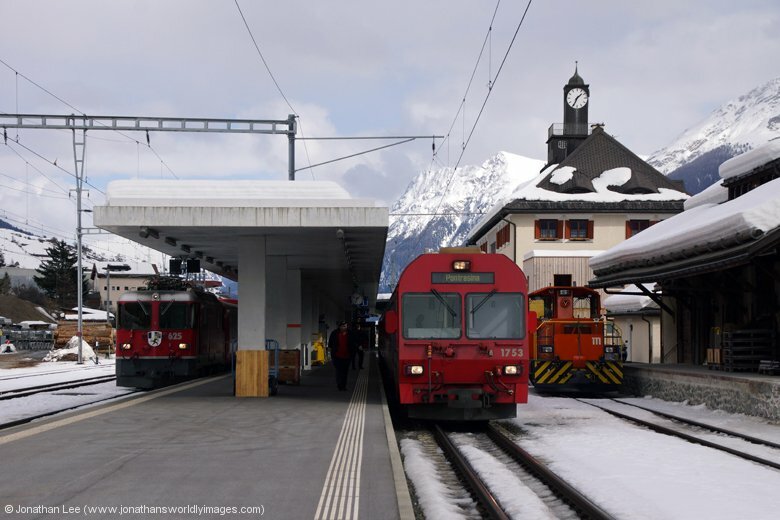 Our day’s travel round the RhB network coming to an end upon arrival at Chur; it having been a thoroughly enjoyable day, riding on non-wedged trains, with no skiers in sight and having achieved everything we’d set out to do that morning. Food that evening was at the Pizzeria Verdi, which is on the corner just opposite the Hotel Chur. The food was cracking, the restaurant comfortable, the staff were friendly and the service excellent; a good end to a great day. 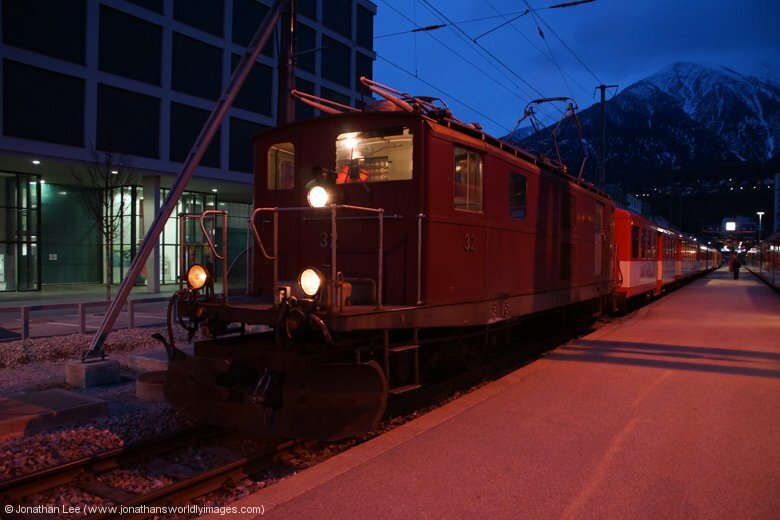 Another early-ish breakfast at the Hotel Chur, on this morning though I took all my stuff with me as we’d be heading off to Locarno; once I’d done the Domat/Ems move for the Ge6/6 II turn again. It was a lot crisper morning than the previous day and probably still sub-zero so my wait at Domat/Ems off RE1121 was quite a cold one. Thankfully though 4221 0753 Ilanz – Chur produced the booked traction for the second day in a row; and a different engine to the previous day, which is always a bonus. Ge6/6 II #706 was the loco, again with two coaches right behind it and 6 freight wagons behind those. Again there were only 6 people on board, including me. 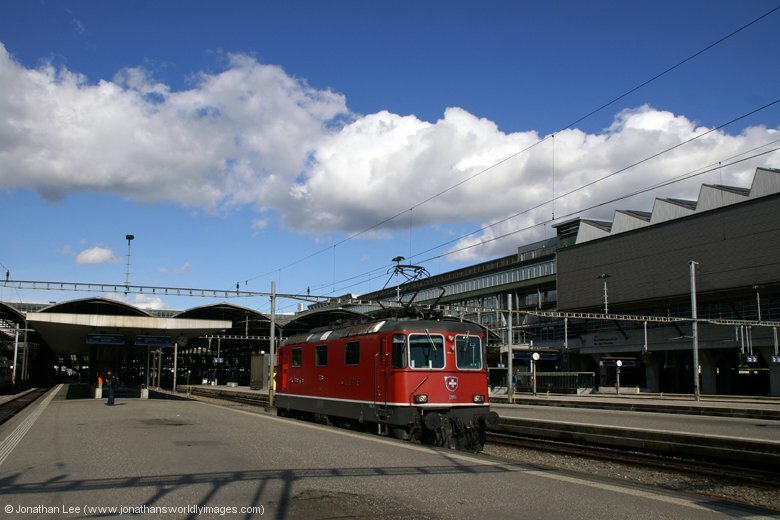 My choice of move at Chur was to do an EMU to Landquart to cover the Re420 turn coming in from Zürich; IC10761 0807 Zürich HB – Chur produced Re420 11124, which was a new one; so correct move played. 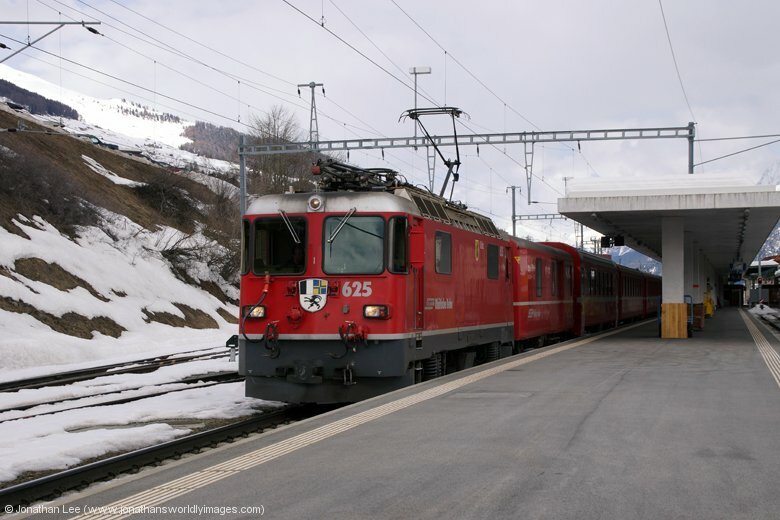 At Chur I met up with my girlfriend outside the station and we did RE1220 0740 Scuol-Tarasp – Disentis to its destination. 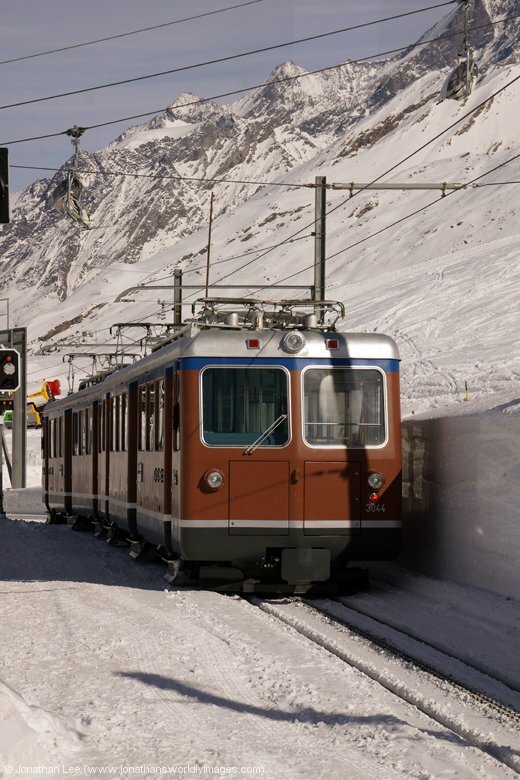 I’d seen most of the other turns that we could potentially do that morning and none of them were new so it was a waste of time getting off anywhere so the late morning could be spent on the MGB line between Disentis and Andermatt instead. 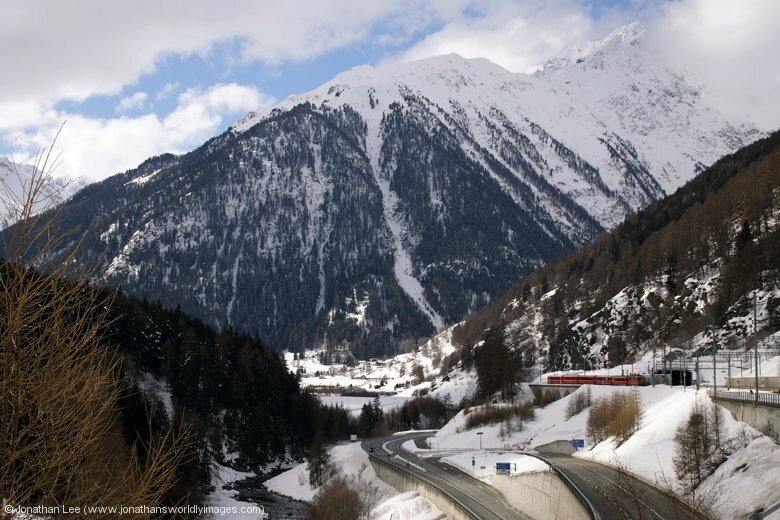 I’d noticed two days previous that the 1214 Disentis – Andermatt had been a Deh4/4 I vice He4/4 II; this turn is a kick-out as the loco that works into Disentis that would naturally form the 1214 to Andermatt then works Glacier Express 903 to Zermatt. I was hoping the same would happen again. 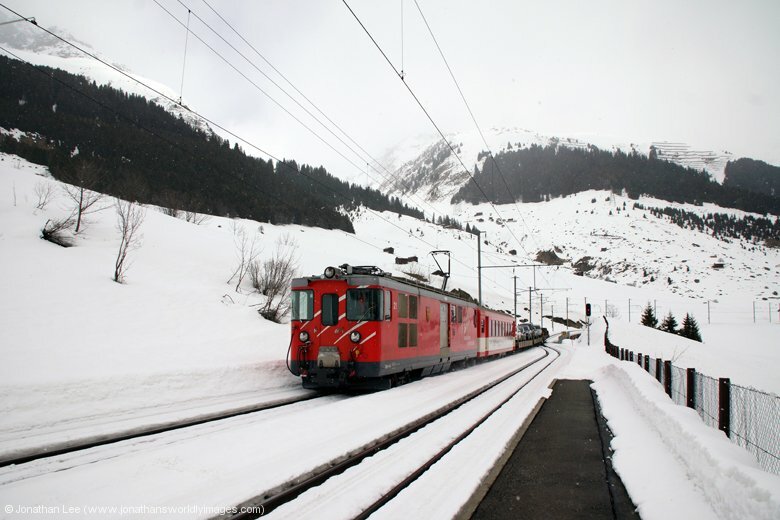 HGe4/4 II #102 was sat waiting with 831 1114 Disentis – Andermatt and we did it forward to Dieni. 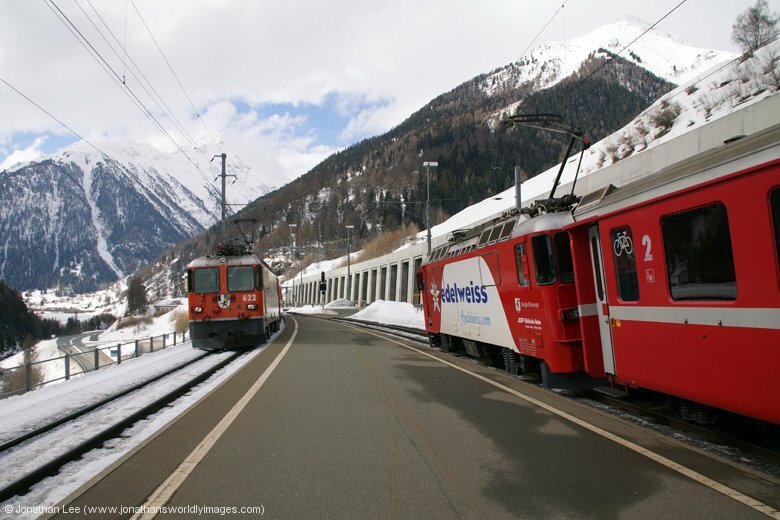 Unfortunately there were two options move wise and I played the wrong one as HGe4/4 II #1 passed us going into Disentis, which would be the loco that did GEX903 back; and I needed it. Still the run to Dieni was a pleasant one, it was overcast again and snowing on and off. 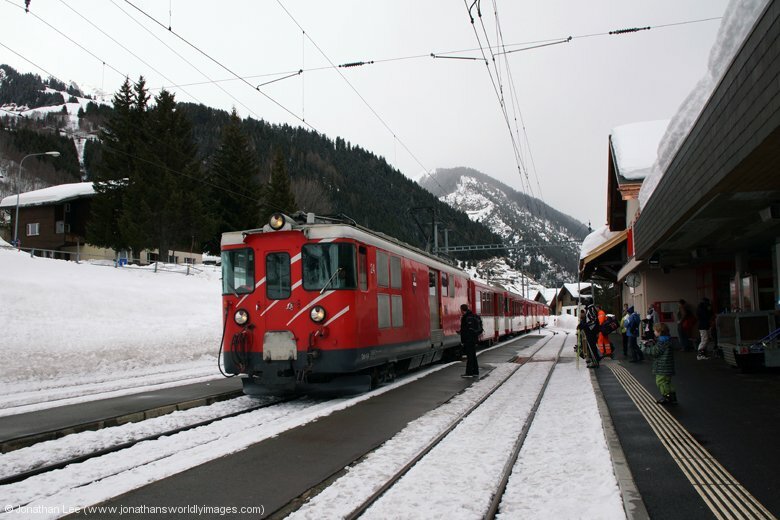 We passed Deh4/4 I #21 at Sedrun, waiting to depart with the 1150 Sedrun – Andermatt ski train, which I then got photos of as it passed through Dieni in the snow. 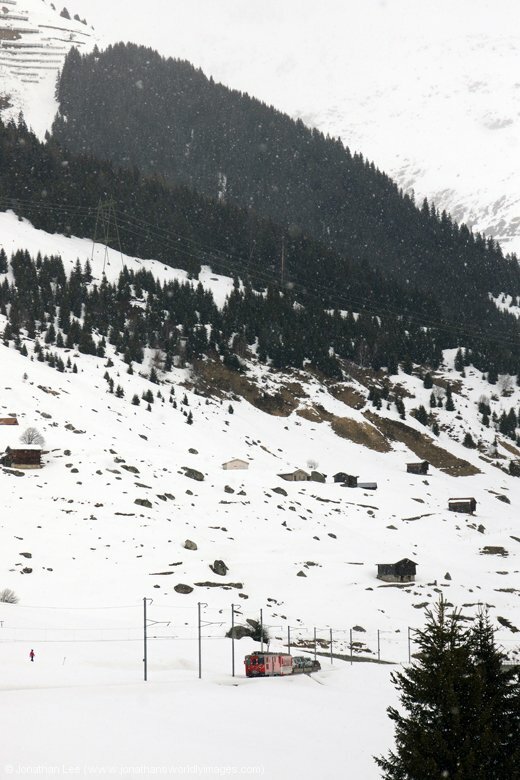 There were quite a few skiers about at Dieni for our train back towards Sedrun by the time it arrived but we managed to steer clear of most; there being a cable car at the end of the platform to take them up into the mountains. 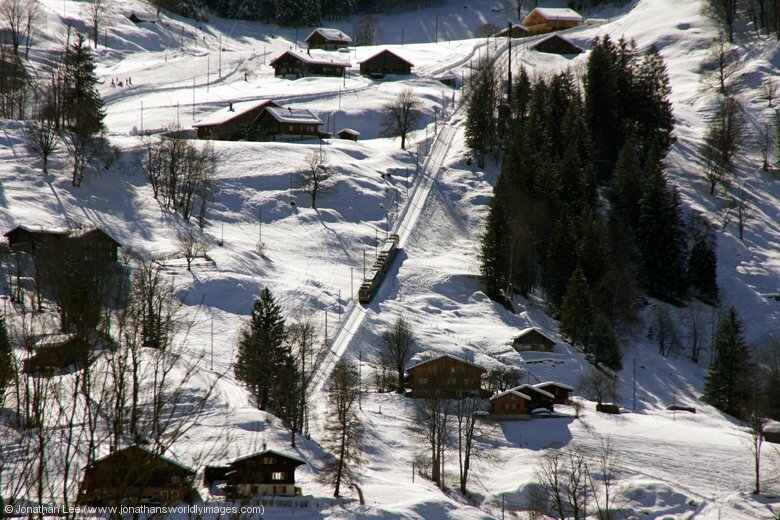 The journey to Sedrun is only a short one and the village can be seen across the way from Dieni; we could have probably walked it down the track and got there well before the train had we set off when we arrived. It was dud HGe4/4 II #104 anyway. It would have made for a nice walk in the snow…. 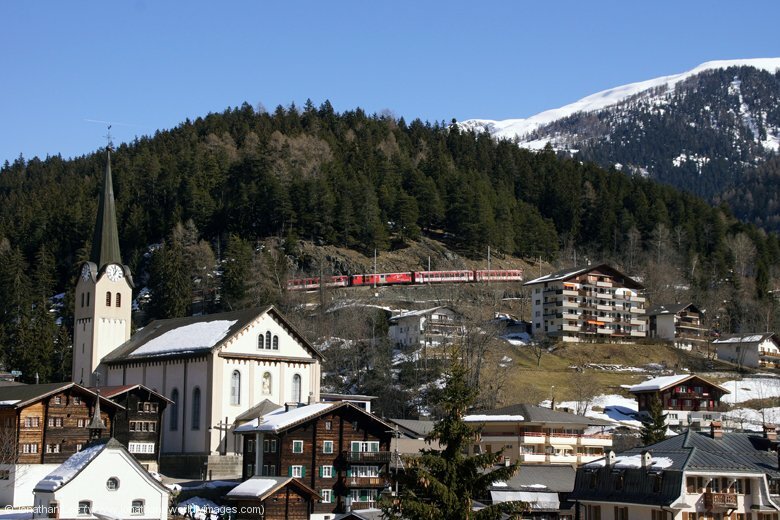 835 1214 Disentis – Andermatt didn’t disappoint as Deh4/4 I #24 arrived into Sedrun with the train, which we did all the way back to Andermatt; passing HGe4/4 II #107 at Dieni with GEX903 0852 Zermatt – St Moritz en-route. 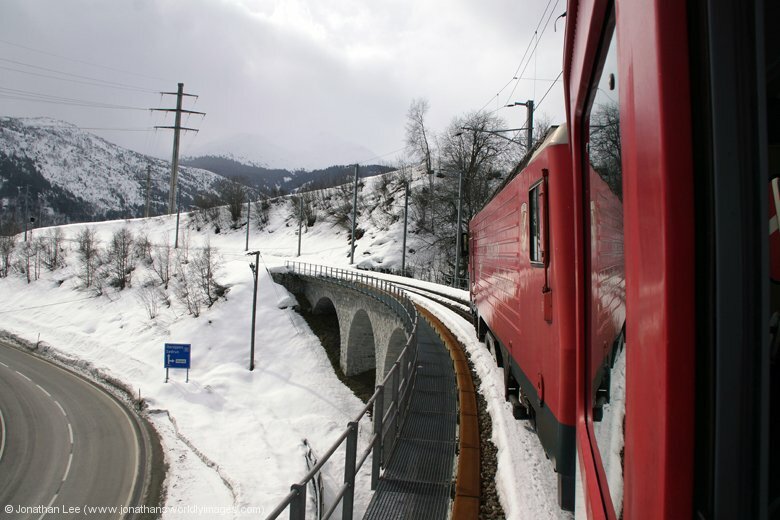 At Andermatt we made the mistake of crossing over the tracks, via the foot crossing, at the Disentis end of the station; this came with a telling off from the guard who’d been on our train. Then a mini argument unfolded when my explanation for doing so didn’t satisfy! There were no signs saying don’t cross, as there are at every other station, and I got the impression that the woman wanted us to cross back over and then go under the subway; which was never going to happen. She then had a chunter when I asked to get out of the barriers as our Swiss Passes wouldn’t open them, she spoke back to us as if we should have known exactly what to do and which barrier to use; which then opened up the floodgates for a bit of abuse to go her way for her complete lack of customer service and understanding. 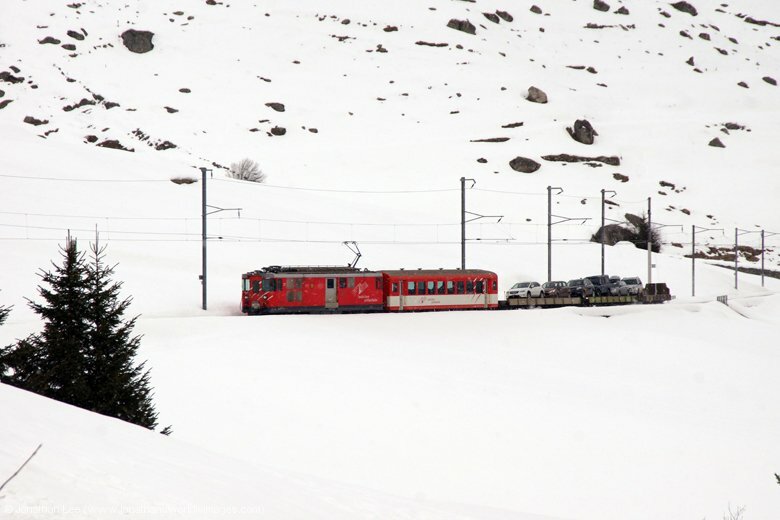 The snow was heavier at Andermatt so unfortunately no great pictures of trains climbing the hillside towards Nätschen; although I only ended up getting one anyway as a bit of a farce unfolded while we were there; which I though might result in us missing our train to Bellinzona at Göschenen. 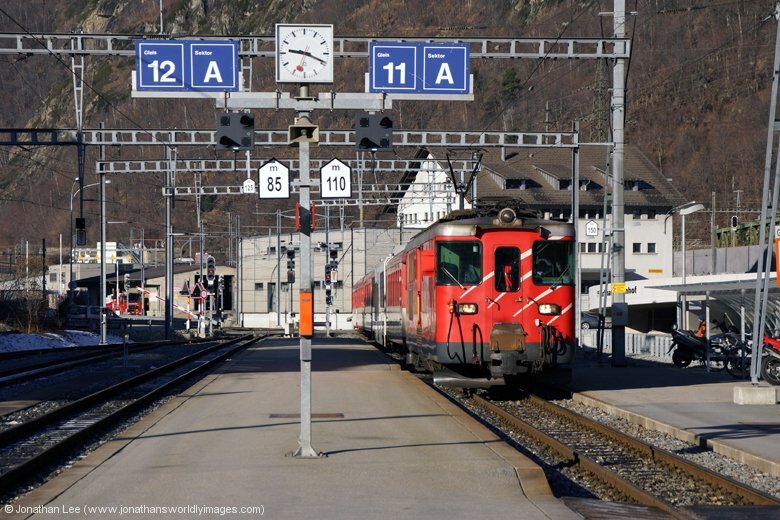 I did manage to get photos of HGe4/4 II #102 departing Andermatt with 840 1327 Andermatt – Disentis before a very long stand in the car park waiting for Deh4/4 I #54 to depart with 842 1355 Andermatt – Oberalppass skit train; which was ultimately cancelled! I figured out something was amiss when HGe4/4 II #106 ran light engine up the hill, before GEX903 had arrived and 842 had departed. It turned out that HGe4/4 II #1 had given up the ghost somewhere in section and 106 had gone to rescue it, hence the ski train being cancelled. Had we stuck to our original plan our move would have been completely down the pan as the train we’d have been on was stuck behind the failed Glacier Express and missed the connection to Göschenen, which would have in turn meant we’d missed the connection at Göschenen to Bellinzona; so thanks have to go to there being no new Ge4/4’s out on the RhB that morning! 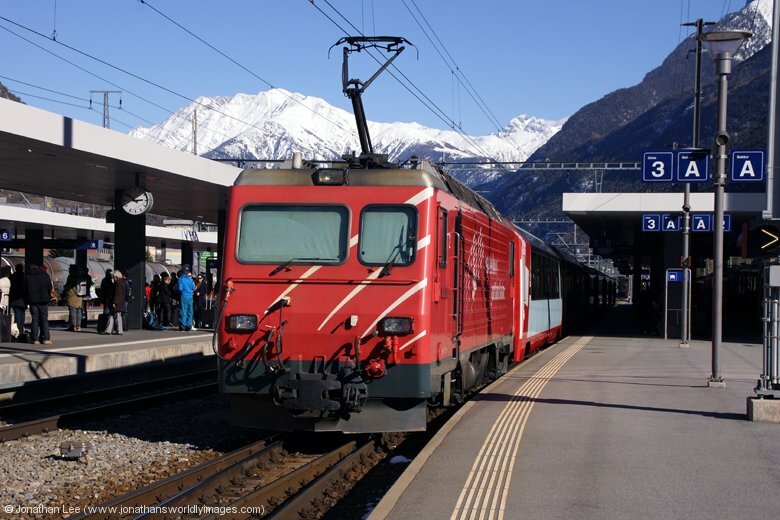 542 1208 Visp – Göschenen departed Andermatt right time, having not waited for any connections off the Disentis line; thankfully. 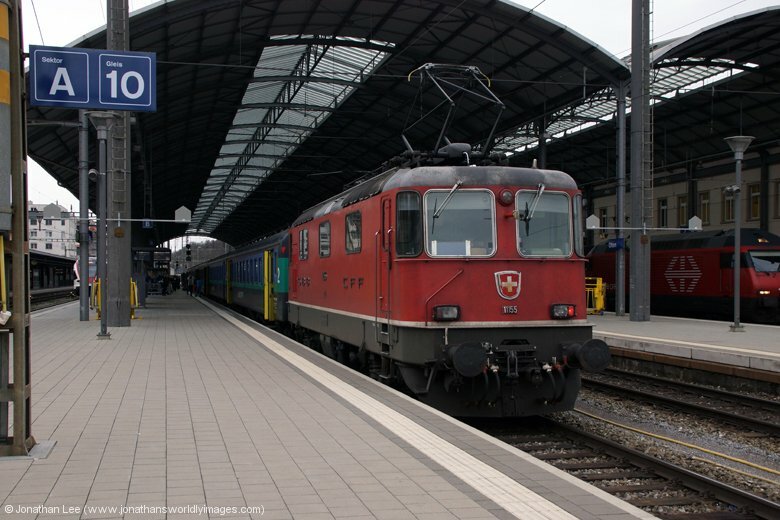 Upon arrival into Göschenen I noticed an unusual looking loco at the head of some green coaches. This turned out to be SBB historic locomotive Ce6/8 II #14253, built in 1919, making its way back to Erstfeld where its homed. It was empty stock but did have some people on board travelling with it. 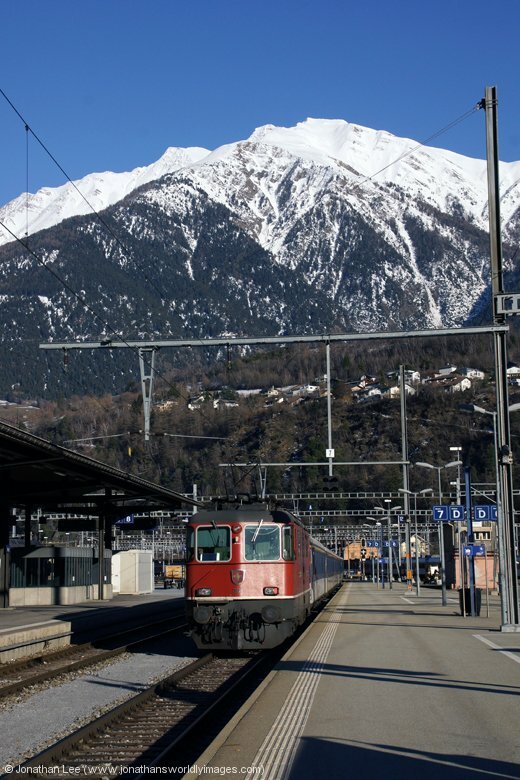 Our conveyance to Bellinzona was SBB Re420 11210 on IR2173 1204 Basel – Locarno. 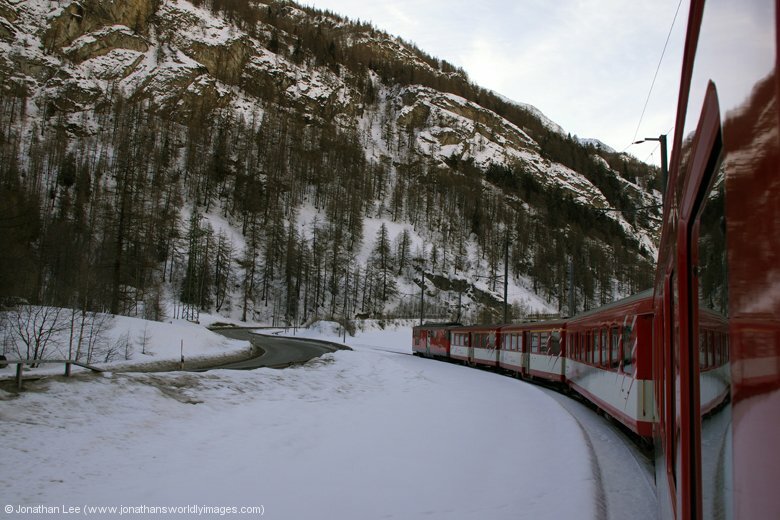 The run over the Gotthard Pass is always atmospheric and this journey was no exception with there being hardly any snow at Göschenen or Bellinzona but it was snow heaven over the pass. It wasn’t the brightest of days but in these parts even the dullest of days can be one to appreciate. 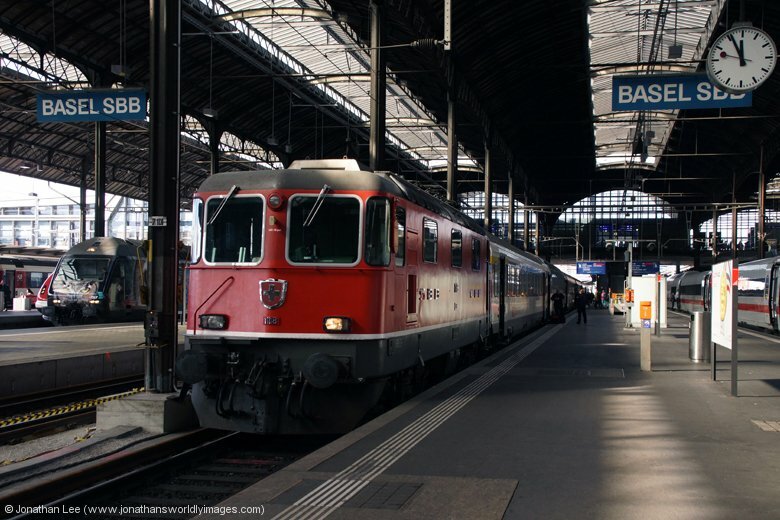 When we stepped off the train at Bellinzona it was like entering a Kindergarten; there were children everywhere, all dressed up in costumes with masks as well. The platforms were actually quite dangerously wedged with little ones! We’d seen adults dressed up in costumes, with a witch type theme, in Brig while we were there and were told there was a carnival in Visp. It turned out that it was carnival season in Switzerland and Bellinzona just so happened to be celebrating its Rabadan carnival while we were there! Even Castelgrande was decorated with a large mask on one of its turrets! Research reveals that the Friday of the carnival is dedicated to the youngest; hence there being children all over the place. The dress code actually being to dress as “fools”! Having figured out what was going on we were so glad we had decided to stay in Locarno and not Bellinzona, for the two nights we’d be in the area! 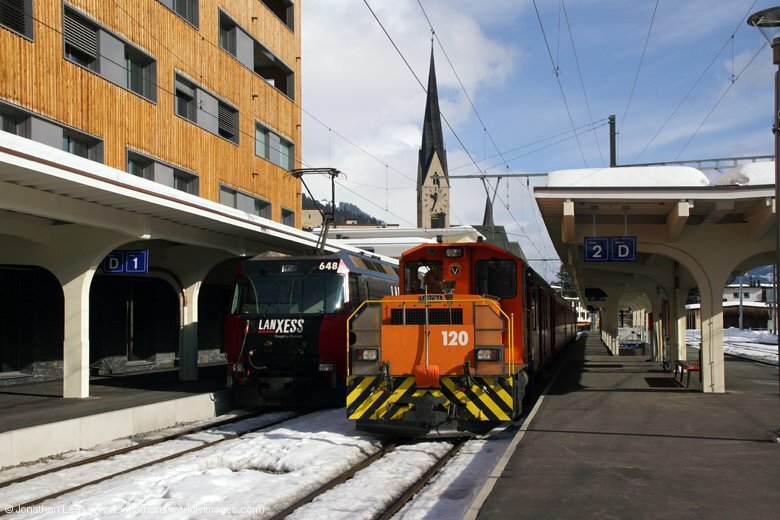 As the SBB Re420 diagrams seemed to be centred around the Basel – Locarno trains for the most part in 2014 there were moves on offer and one fell into place that afternoon. 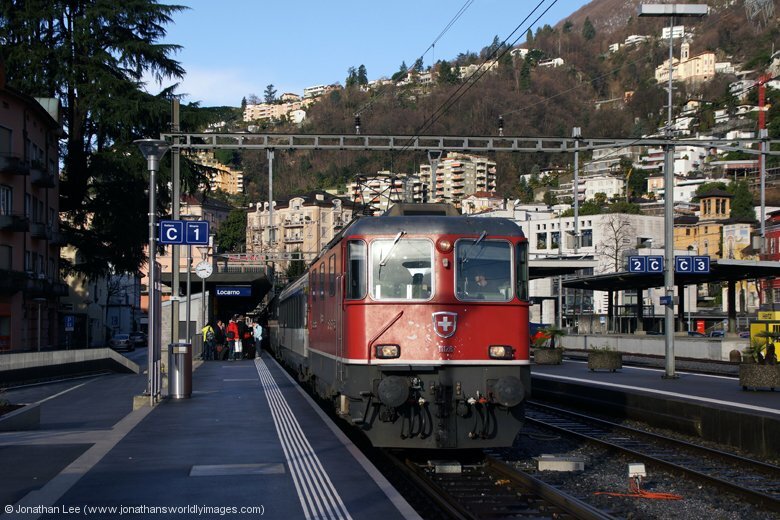 I’d originally planned to do 25777 1650 Bellinzona – Chiasso throughout for an Re460 back but we’d decided to go to Como the following day so would get Chiasso in then, so to punt for an early finish we did IR2184 1547 Locarno – Basel back to Biasca with Re420 11118; which at least gave us time to nip to the local supermarket and stock up on cheap pop, before returning all the way to Locarno with Re420 11147 on IR2275 1409 Zürich HB – Locarno. 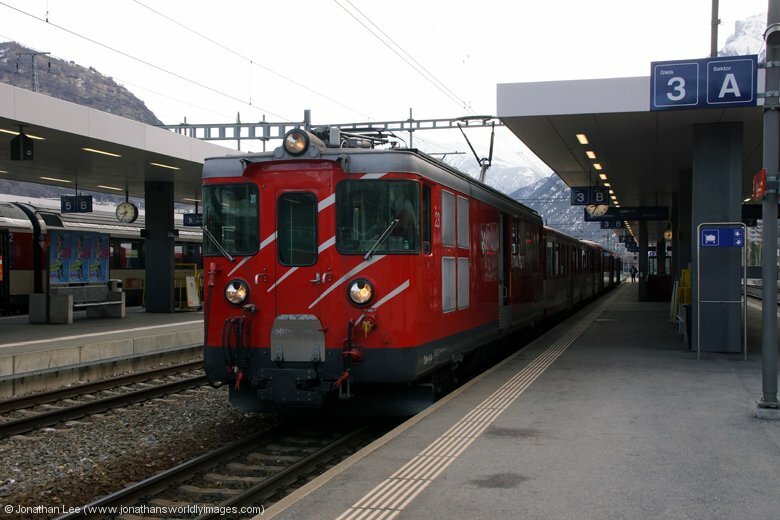 As we arrived into Bellinzona Re420 11212 was just departing with 25777 to Chiasso and in the station area were 11191, 11196 & 11219; the latter two attached to sets. 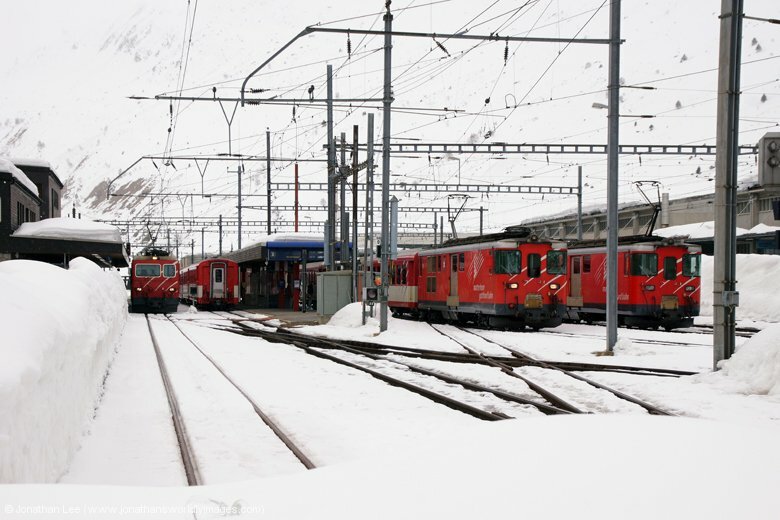 I also couldn’t help but count the number of Re4/4 & Re6/6 in Bellinzona Yard; it was flooded with them, 23 in total. We’d seen at least two trains while on our way to Biasca that had mixed pairs of three locos and the total in the yard didn’t even begin to take into account the other loco types there! It was miserable in Locarno, the bright start we’d had, followed by snowy afternoon then atmospheric evening had turned into a cold rain. Luckily our Ramada Hotel La Palma ua Lac wasn’t too far from Locarno station and took about 5 minutes to walk there. Its right on the lake front and the views from our balcony were excellent; even if it was a miserable end to the day. The hotel was spotless, the room was spacious with all the mod-cons and the staff spoke at least three languages, including English. The price was quite reasonable for a 4 star hotel as well; which was why we’d stayed there in the first place. 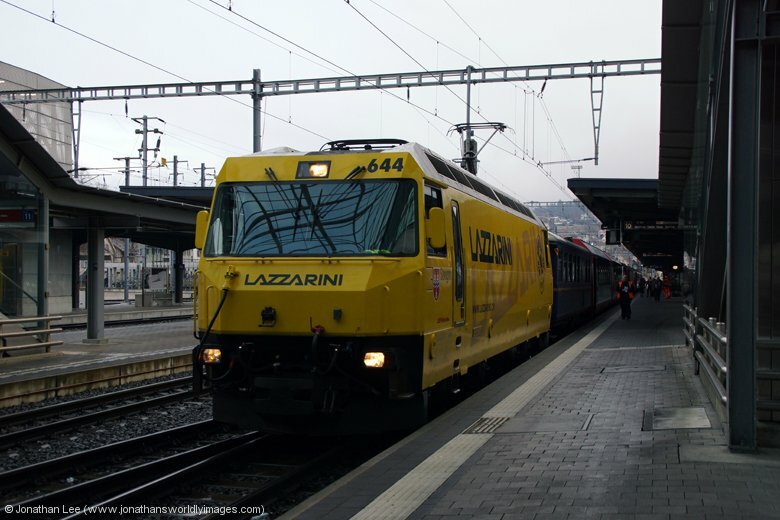 The bash wasn’t over for the day as there was another Re420 turn coming into Locarno that had potential to reveal a new one so we did 11147 back out on IR2288 1847 Locarno – Zürich HB, only to the first stop at Cadenazzo where it was a plus 4 onto IR2279 1609 Zürich HB – Locarno back; which turned up with Re420 11133. We’d had a quick look at restaurants before doing the move, most of which didn’t seem to open until 1900, and had settled for the Restaurant-Pizzeria Carbonara; which was virtually opposite the station. It wasn’t full, the service was good and the food ok too; with massive pizzas! 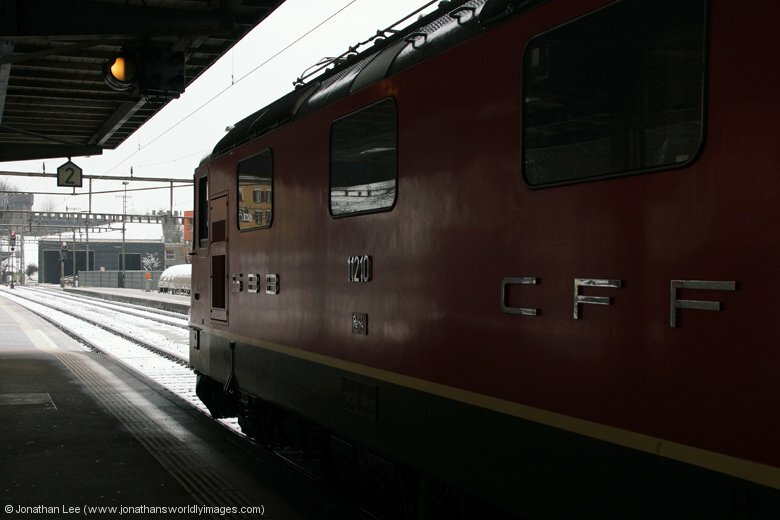 The view from the window seats was right onto the station so we could watch trains arrive and depart….. It had been a long day and we’d covered some distance but it was an enjoyable one as well; I was ready for bed that night though! 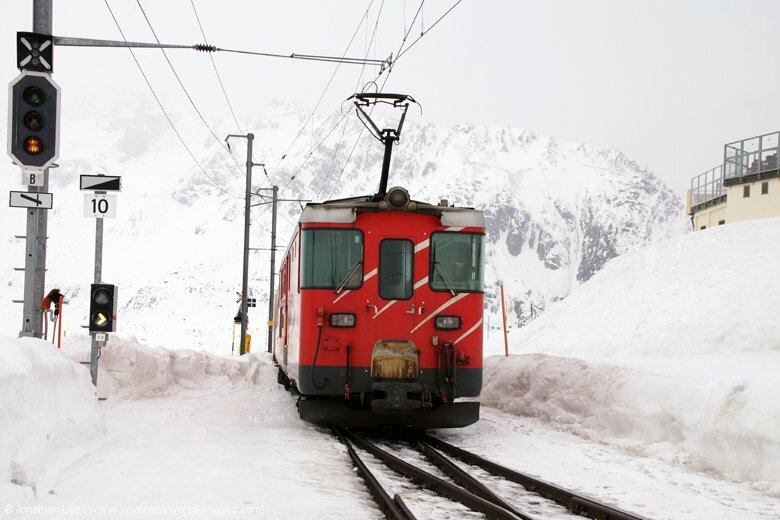 106 – Light from Andermatt towards Disents to rescue train 903; #1 having failed main line! 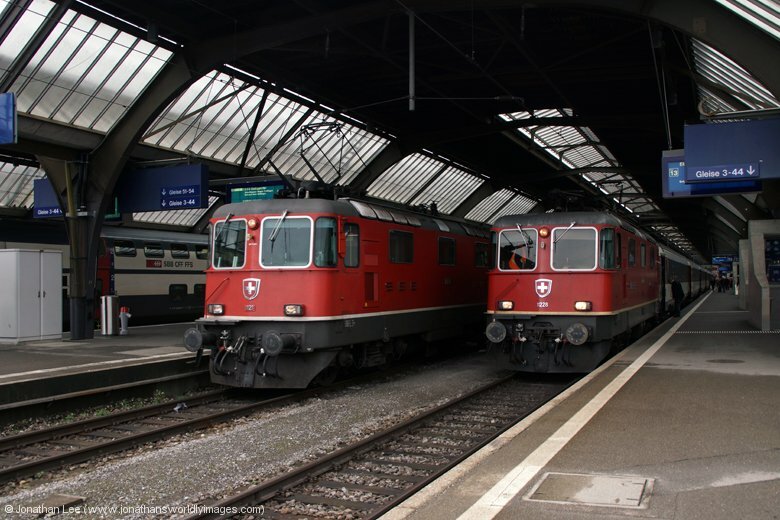 No less than 23 SBB Cargo Re4/4 & Re6/6 in Bellinzona Yard! The view from the room balcony revealed snow; and it was still snowing. A good start to the morning but unfortunately one that wouldn’t last throughout the day. Breakfast at the hotel was excellent with a vast choice from fruit, pastries, meats, bread and even scrambled eggs and sausages. Either way there was plenty enough to make a decent pack-up! We were on IR2268 0847 Locarno – Zürich HB to Bellinzona with Re420 11210; it having come in on the rear of IR2155 0818 Bellinzona – Locarno with Re420 11161 heading the train. 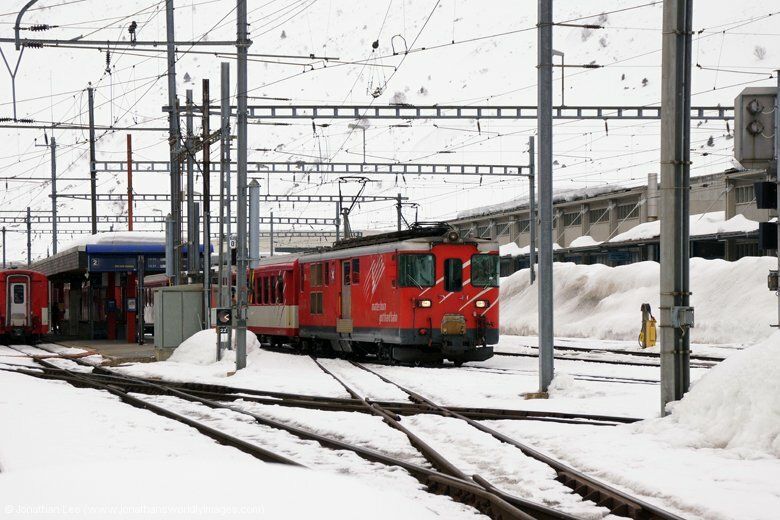 It was a cold morning at Bellinzona and the snow was turning wet. With time to kill we had a wonder down to Castelgrande; the streets were covered in confetti and the trees lining the roads were decorated with balloons; it was a definite morning after the night before type scenario, which obviously hadn’t been cleaned up yet. We’d seen carnival stragglers at Locarno that morning looking a bit worse for wear so it had obviously been a good night out, despite the weather. While we waited for our train to Como S. Giovani Re420’s 11191 & 11196 were swapped over in the station, this making 11196 the spare engine and 11191 was then attached to a set. 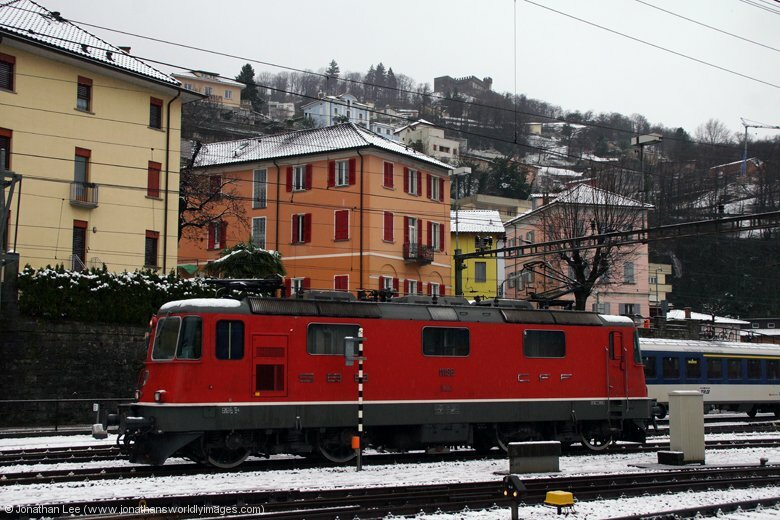 11210 also departed towards Locarno with IR2159 0604 Basel – Locarno. 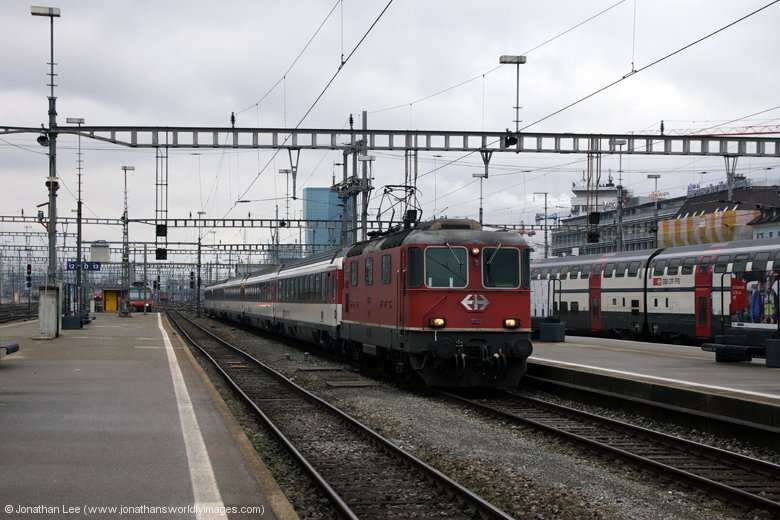 Our Euro City EC153 0747 Luzern – Milan Central arrived on time with Re420 11140 and load 4. Despite us having reserved seats to Como it didn’t really seem to make much of a difference where we sat and ours were occupied anyway. As we headed towards Italy the snow turned to rain yet the views over Lake Lugano, as we passed by, weren’t destroyed by the rain; in fact if anything it made the whole area look more atmospheric with the snow capped mountains surrounding it. By the time we got to Lake Como I was soon wishing we’d done Lugano instead! 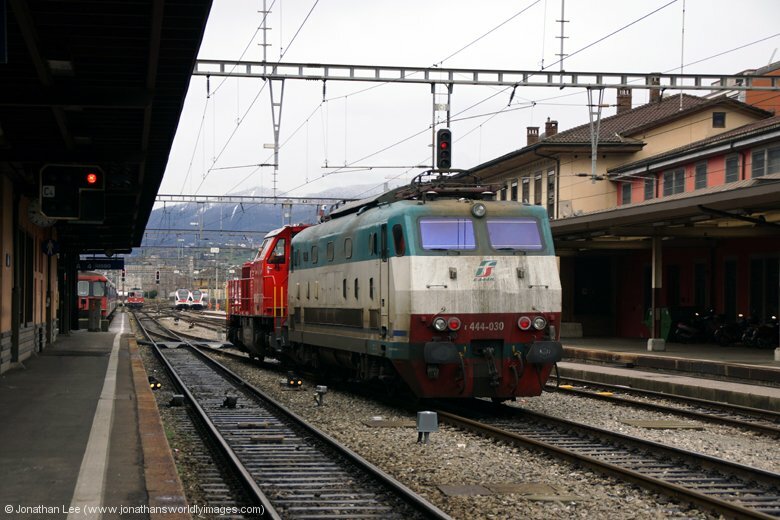 At Chiasso SBB’s 11140 was immediately removed and FS’s E444030 replaced it for the run to Milan Central. 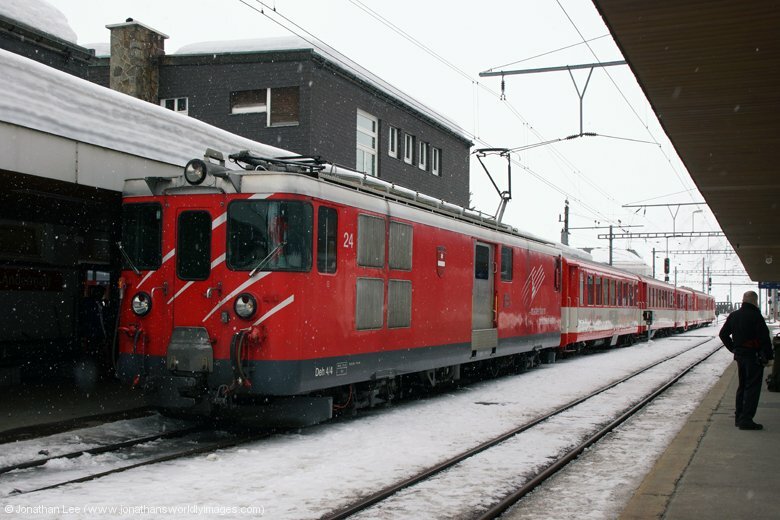 In the station area were a couple of Trenord E464 sets and SBB Re420 11198 on a set, spare. It was at this point that I realised that the locals from Chiasso to Como were worked by Trenord E464’s and that we’d paid over the odds to get to Como S. Giovani, just for the sake of doing it loco-hauled. 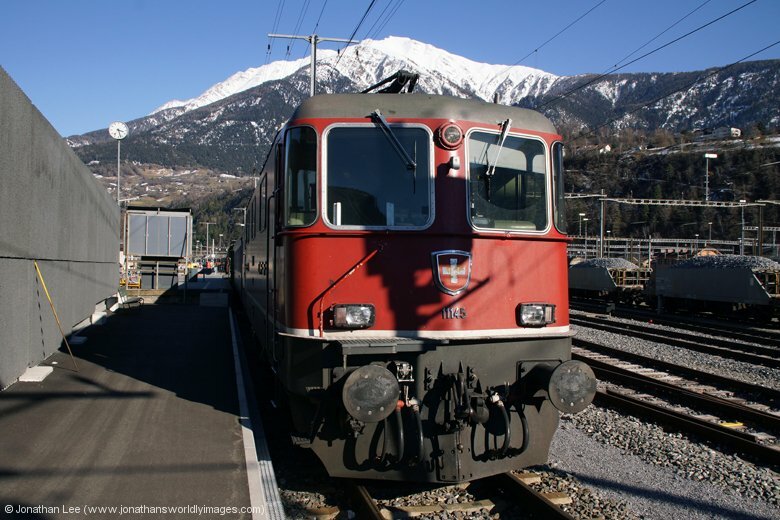 When I’d bought the Chiasso – Como S. Giovani tickets at Locarno that morning the guy at the ticket window had suggested we use a local train from Chiasso but I’d insisted we go through on the EC, just so we did it loco-hauled. 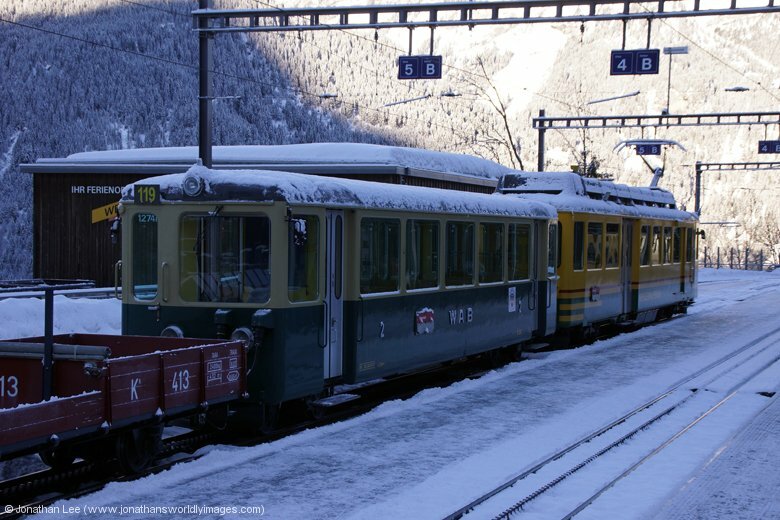 It cost CHF13 each for the 4km journey from Chiasso to Como S. Giovani when it would have only cost a couple of Francs each on a local! The short journey from Chiasso to Como is through a tunnel for the majority of the journey and upon arrival I was straight to the booking office to get the return tickets on the Euro City train cancelled and changed for a local ticket instead; however FS had other ideas and I wasn’t allowed to cancel the tickets, so just had to lump it and accept the mistake I’d clearly made. Outside the station the rain was pouring down; it was one of those days that if you’d been at home you’d turn up the heating and just watch how miserable it got from the comfort of your front room, feeling nice and snug as you did so. As we’d made the effort to get to Como we walked down to the lake, in the rain; it was a cold day as well. The walk from the station takes about 10 minutes to get to the lake’s edge, once there we didn’t really go that far and spent some of the time sheltering under a tree. The rain putting a massive dampener, literally, on the day; which was a shame as the views were excellent and the surrounding mountains were topped with snow. Atmospheric or not we were cold, wet and fed up within 30 minutes of being out in the rain and back at the station within 90 minutes. When your girlfriend actually tells you to get her on a train to anywhere, just to keep warm, you know it’s not a good day out! 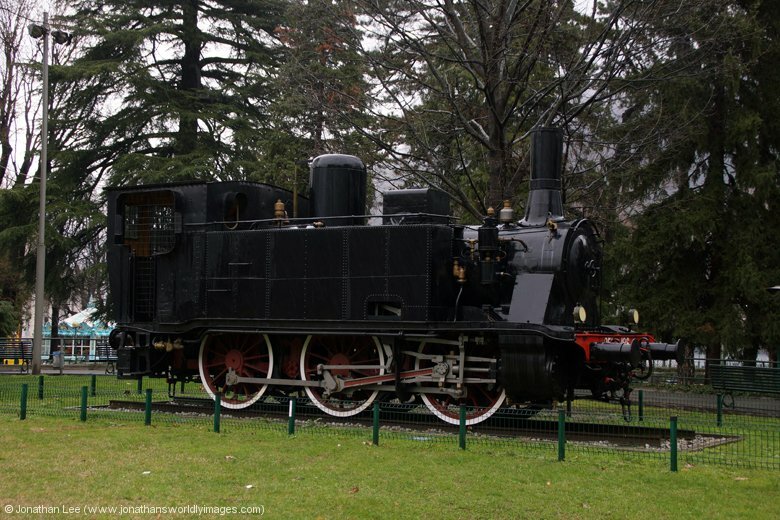 As we headed back we found a steam loco plinthed on the lake’s edge; 851.186, which strangely was in pristine condition without any graffiti on it at all. 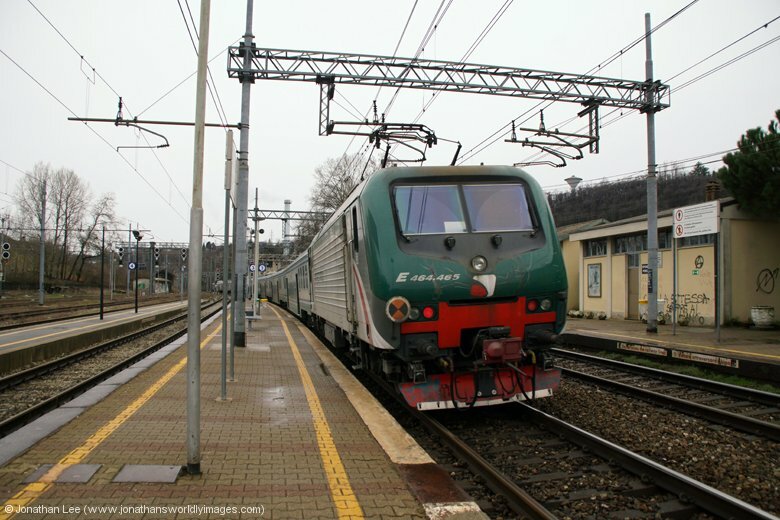 Having scanned the EURail app on my phone I’d worked out that we could do Trenord Chiasso – Milan trains to Albate, the next stop towards Milan, for a plus 7 onto the next one back so a ticket machine was found and that’s exactly what we did, twice. Although there was a nice new unit on one of the diagrams that did unfortunately fit into any move we could do and only made for extended festers, which we opted to do at Como rather than out in the sticks at Albate! Tickets only cost €1.30 each, for a single in each direction. The first trip out was ok but if there’s a tight plus it is going to miss as the only access to the Como bound platform is across the tracks, which is via the tracks that you arrive on from Como; so if the train is coming in the other direction while the one you’ve got off from Como is departing that’s the end of that! 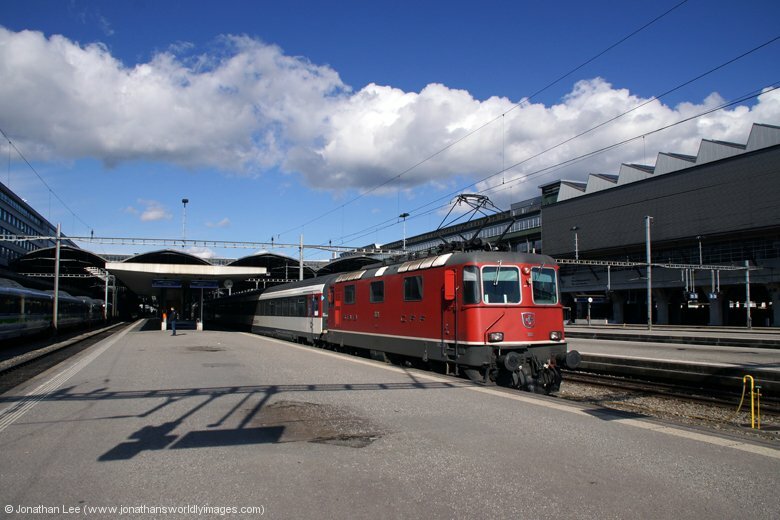 Our second trip to Albate nearly didn’t materialise due to the fact that the screen at Como S. Giovani couldn’t make up its mind if the return train from Albate was either on time, 5 minutes late or 10 minutes late; it flicking between all three every time it refreshed itself. The conclusion I drew from it was that it was about 10 late, which in theory should mean that or EC158 back to Bellinzona would be in front of it but I wasn’t convinced this would happen and assumed that our EC158 would remain behind the local to Chiasso and just be a few minutes late; so we went for the move anyway. 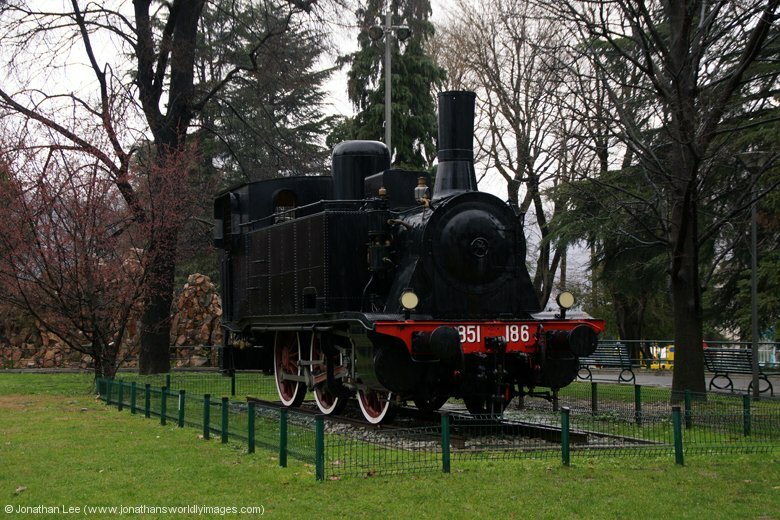 The worst case being that we’d just have to do the local through to Chiasso and get on EC158 there, where it had time sitting during the engine change. There was no sign of us passing anything as we headed out to Albate on 25053 1416 Chiasso – Milan P Garibaldi with E464465. It was a slightly anxious wait at Albate but as suspected the local turned up first with E464241 working 25042 1339 Milan P Garibaldi – Chiasso. 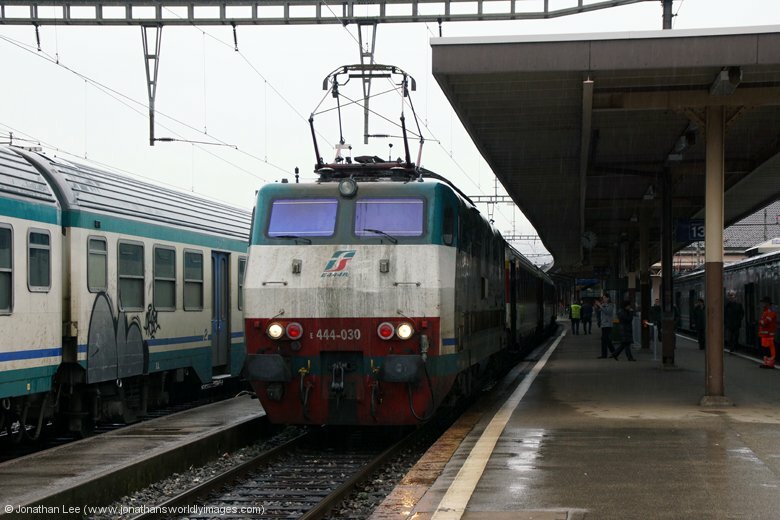 The screen on platform 3 at Como S. Giovani confirmed that EC158 was running 5 late and E444030 rolled in shortly after E464241 departed with 24042. 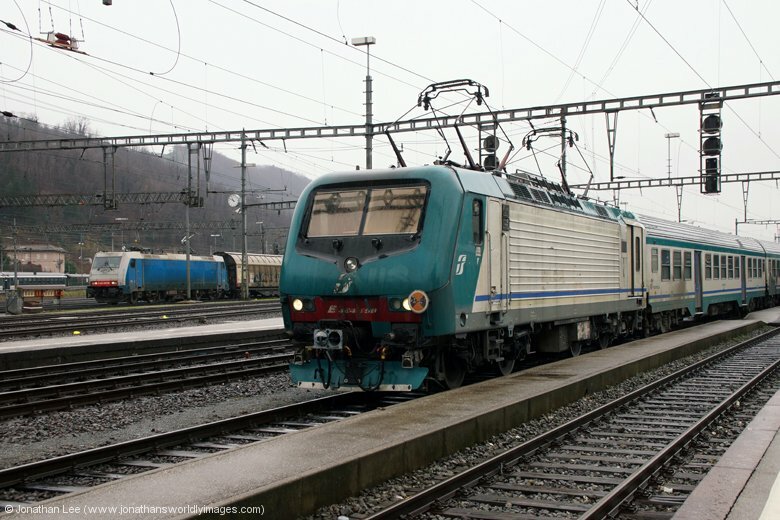 It was dragged off the train at Chiasso by SBB 843043 and SBB Re420 11140 was poised waiting to drop on once the shunt move had taken place. EC158 was the first place we’d managed to get properly warm and even remotely dry, since our outing in the rain at Lake Como. 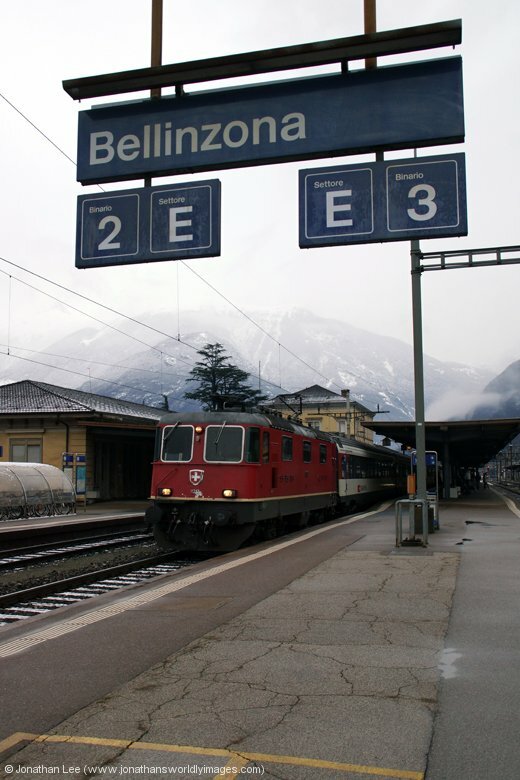 As was always the case the rain had stopped when we left Italy and it had brightened up a little but our spirits had been dampened enough by then to prevent us returning to the lake’s edge that afternoon and we were thankful of a nice warm train to take us back to Bellinzona. 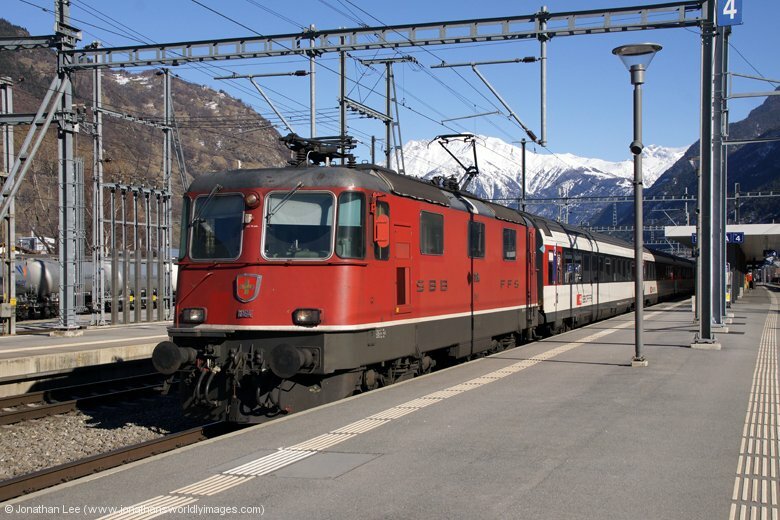 Two return trips to Biasca followed that afternoon, both of which were as booked, Re460’s out for Re420s back; 11212 having stuck to diagram as it returned from Zürich with IR2275 1409 Zürich HB – Locarno, likewise 11210 had also stuck to its diagram as it headed IR2177 1404 Basel – Locarno to its destination; where we called it a day. Food that evening was at the Ristorante Oldrati, which is near the station, by the lake front. The food was good and the homemade Tiramisu was excellent. SBB Re420 11118 brought in IR2155 0818 Bellinzona – Locarno with Re420 11128 on the rear, pan up. 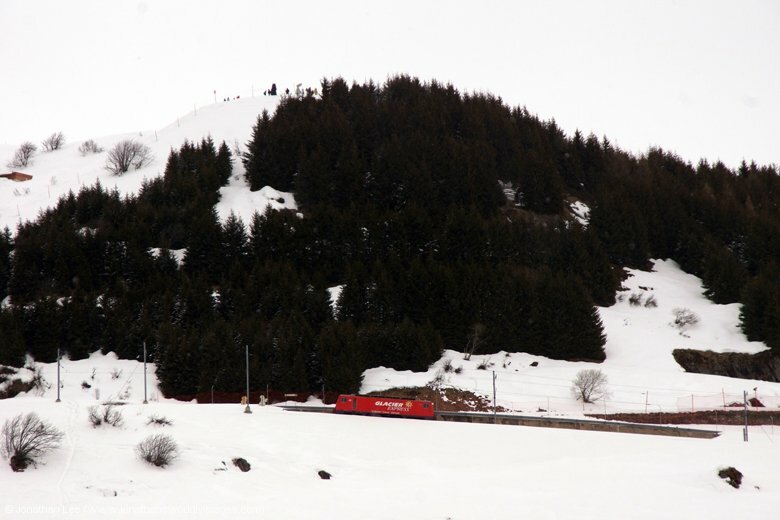 The train only has a few minutes turnaround so there wasn’t much time to get photographs before boarding and making ourselves comfortable for the 3 hours journey to Zürich, via the Gotthard Pass. Unfortunately the set was a full set of air-cons and didn’t have a coach with opening windows; this limited the photography somewhat but didn’t stop us enjoying the scenery that the Gotthard Pass has to offer, especially in the middle section where you can see both where you’ve been and where you’re going at the same time as the line is both above and below you! Re420 11228 backed the stock in to form our train; it should have been green Re420 11161 by diagram but maybe the Lenzburg tunnel closure had put pay to that? While waiting to depart Re420 11133 arrived with EC183 0953 Stuttgart – Zürich and 11121 backed straight on to form EC186 1305 return to Stuttgart. The conductor on board our train couldn’t apologise enough when she announced that our arrival time into Basel would be approximately 4 minutes later than the advertised time due to being diverted via Brugg on our journey. Of course 4 minutes wasn’t going to bother us at all and all we had to do on arrival into Basel was walk out of the station doors and onto the first No.50 bus to the Euro Airport; this actually turned out to be the second bus as the one waiting was full and standing, which wasn’t an issue with them being every 10 minutes. That was it; holiday officially over! Getting through Basel airport wasn’t too bad but the queues for security once we’d gone though were beginning to get rather large. Our BA flight was on time and the Piccadilly Line from Heathrow was operating ok, giving us plenty of time to wonder over to St Pancras for some food before our 2015 train back to Doncaster. Despite being a normal trip there was plenty of Re420 action to be had; even though the diagrams are more limiting than the previous timetable. 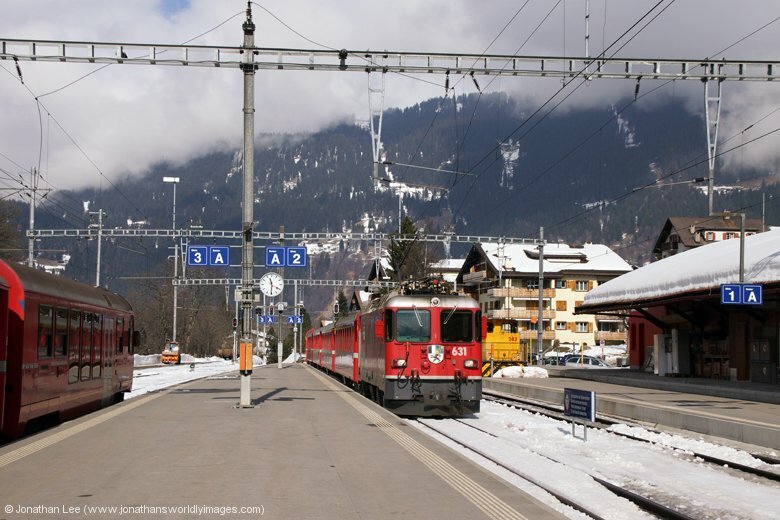 And with Re420’s substituting on the BLS Bern – Luzern circuit it was a massive bonus for me to get one in. 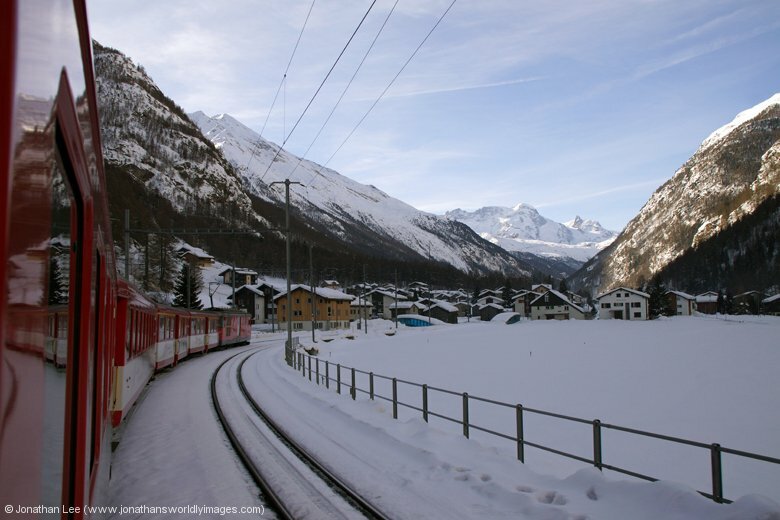 Even though the lines up to the mountain peaks at Jungraujoch and Gornergrat are EMU’s the views they offer are well worth making the trip; even if they may seem a little costly. 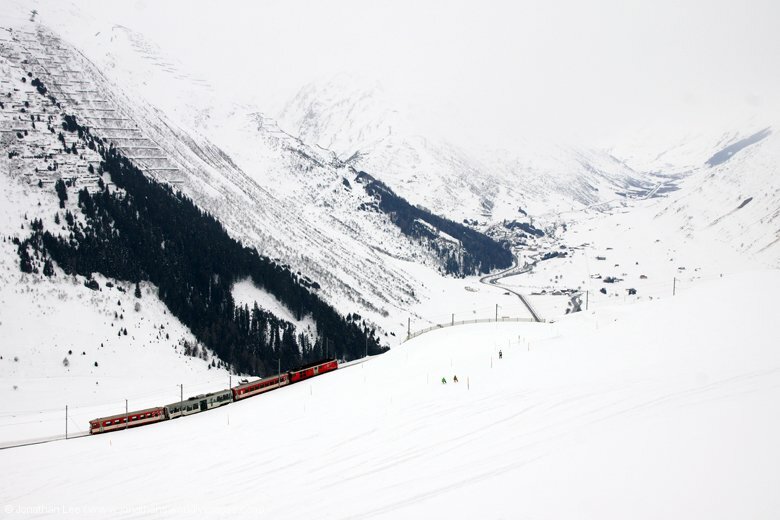 The best part of the trip for me has to be the time spent on MGB in the Andermatt area; with snow, hills to climb, photo opportunities and solid loco-hauled trains what more could you need?! 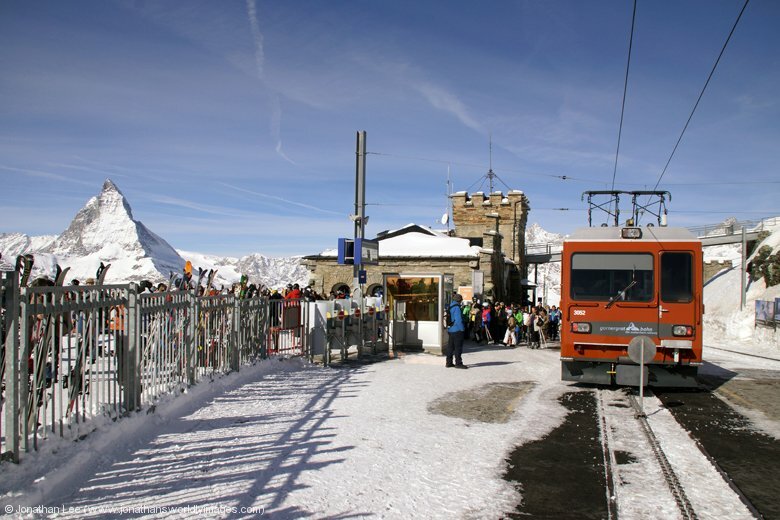 For info, the two stops on the jungfrau are deliberate to allow time for visitors to acclimatise to the thinner air as they get higher and higher. This is not needed on the way down. I also read that the owner of the Good Night Inn has bought a large model railway rescued from somewhere and intends to set it up in the basement! Ay up Shovel! Enjoyed your trip report no end. 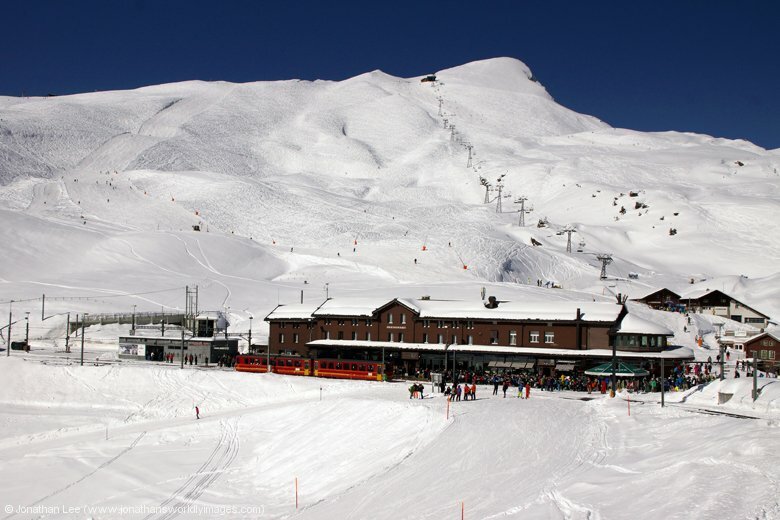 Julie and I went out on 2nd March to do Rhb, based at excellent Hotel Gruschuna at Filisur. Bumped into John Asher who was also staying there! Viewed lok 222 on Monday morning on a wake-ex! Dreadful indeed.